Here is where we will post news and tips for and about the California casinos and card rooms, including card casinos where poker tournaments are played as well as the Indian casinos which offer a wide range of casino gaming including those games you find in traditional Las Vegas casinos. Some of the news here is about efforts to make online poker available in California. Also see our "Poker News and Commentary" page. Update July 19, 2018 After several tries during the past few legislative session, the California legislature has still not been able to pass legislation to set up online poker casinos in the state. However, online poker sites are operating in Nevada and in other states. While the online sites are operating legally within state borders, local banks and financial institutions are hesitant to do any business involving online casinos. It's a real problem that can show up for players even at brick and mortar casinos. Just to give you an idea about how nervous banks are about online casinos, I received a check for a jackpot at Caesars Palace -- the brick and mortar casino in Nevada -- but Bank of America put a lengthy hold on the check and several managers questioned me whether the payment had any connection with online poker before they would release any of the money from the check. The fact is, it is lawful for consumers to play online poker and states can legalize online poker sites within their borders. But banks and credit card companies fear that federal agencies will stop them from handling transactions or penalize them. Online gaming probably won't be at full speed until the banking systems embrace legal online gaming sites and allow the sites and players to use the banks and credit card companies for transactions. There are other options to fill the banking and credit card gap and one payment alternative that players are using is pre-paid cards. Pre-paid cards can bypass both banks and credit card companies. In the meantime we expect that another attempt will be made in Sacramento to legalize online poker in California. Getting the banks and credit card companies to cooperate seems to be another problem so players might want to set up alternative payment systems. Update September 5, 2017 Boyd Gaming has announced that the California legislature has ratified a new gaming compact with the Wilton Rancheria Tribe that will allow for the development of a new casino in Elk Grove about fifteen miles from Sacramento. Boyd Gaming, which is headquartered in Las Vegas and operates several major casinos in Vegas, has a contract to operate and manage the casino. Construction is expected to start in mid-2018 and will take about two years. What will be interesting to see is if players at the Sacramento-area casino will be able to accrue benefits for use at the Vegas casinos operated by Boyd? There was no mention of that in the Boyd announcement. Harrah's Resort Southern California which is the Rincon Native American casino in San Diego is managed by Caesars and there is the opportunity for Total Rewards members to accrue and use benefits at both the San Diego property and other Caesars resorts around the United States and overseas. Boyd Gaming casinos in Vegas include Sam's Town, The Orleans, Gold Coast and Cannery. California is the #1 market for Vegas casinos and this move by Boyd Gaming into the Northern California casino market could help it draw visitors to its Vegas casinos and it will also put pressure on Caesars and Total Rewards in Southern California. Could this announcement by Boyd signal a new round of higher competition for California players? And could it force other Califonria casinos to negotatiate terms with Vegas casino companies. It is well known that many players choose to gamble at Rincon in San Diego so they can get benefits when they play at Caesars Total Rewards casinos in Nevada. Many of the big casinos in Southern Califonria are not associated with or have deals with Vegas casino companies now. This could pressure other Native American casinos in California to align with other Nevada casinos if they find Califonria gamblers are attracted to the Vegas connections. Update July 14, 2017 Casino Morongo, in Cabazon near Palm Springs on the 10 Freeway, has announced for a limited time a special 2-for-1 price for its Saturday and Sunday champagne brunch buffet. The champagne brunch buffet is from 9-AM till 2-PM and the price for this promotion is two for $26.95 plus tax and a Casino Morongo players' rewards card. I am not sure if this is restricted to certain levels of the Morongo rewards club so check with the casino as conditions can change. At two for $26.95 you can't buy these groceries and cook the goodies yourself. Morongo says "choose from traditional breakfast items including made-to-order omelets and waffles, luscious eggs benedict, all-you-can-eat shrimp, a full complement of Asian dishes, and savory prime rib. Then indulge in delectable desserts from our award-winning Pastry Chef, and our bottomless Sparking wine. All your favorites are cooked to perfection every Saturday & Sunday Brunch at Potrero Canyon Buffet." The promotion is not available on certain holidays and take note that they are serving sparkling wine even though it's called a champagne brunch. Update March 9, 2017 The biggest casino in the State of California is the California Lottery. And now, the California Lottery has a high-limit branch for players that includes $30 scratchers. When I first saw the $30 scratcher I was shocked. Most scratchers that I've seen were the $1 and $2 and $5 kind. I had heard about $10 scratchers, but $30 tickets? Yes, they are real. The top prize for the current $30 game is for $10-million, and as I write this, three out of the four top prize tickets are still available. The bottom prize is a free ticket and the smallest cash prize is $40. The odds of winning something are 1 in 2.62 while the odds of winning cash are 1 in 4.65 or less than one in five. Second place isn't bad either for this scratch-off game at $750-thousand. There are eight tickets worth $750,000 and four of the eight prize winning tickets are still available. A $30 lottery ticket is not something you'd buy with the change from your lunch, but it is something you might buy as gift for a birthday. By the way, a bit more than 1.6-million of these tickets win $40, for a $10 profit. Update November 2, 2016 The newly remodeled Hollywood Park Casino in Inglewood, California, has 125 table games including two blackjack-styled games called Shaq Jack. It features a silhouetted figure of a basketball player and that's no accident. Famed Lakers basketball player Shaquille O'Neal licensed his name for Shaq Blackjack, but a floorman at the Hollywood Park Casino told me that Shaq himself did not create the game. where there are two tables available. Shaq Blackjack has various side bets in addition to the basic blackjack bet. The side bets, or bonus bets, have big payoffs, but they pay at less than true odds for the various hands that you are betting on. There is nothing unusual of course about this because that's how the casino makes a profit -- with bets that do not pay at true odds. The game includes a form of insurance bet as well which gives you up to half of your money back if you bust. This game will appeal to "action players" who aren't satisfied with a blackjack game where the goal is just to beat the dealer. with bonus payoffs and a type of insurance bet. There are two of the Shaq Black Jack tables at Hollywood Park and I was told this is the only casino in the country where the game is available for live play. I was told that the game first appeared as an app on cell phones. No one was playing when I visited the casino to take the photos and I visited this casino several times in the past few weeks and I've never seen any players. Hollywood Park also has traditional blackjack games. licensed his name but did not invenet it, I was told. Update October 16, 2016 The new Hollywood Park Casino in Inglewood is very impressive. The casino now has its own free-standing building and there is a nearby parking garage. There is free parking on the upper levels. There is easy access to the new casino from Century Boulevard and the new casino building is near the original casino site. as seen from Century Boulevard. games and there's a separate horse betting area. What is very exciting and welcoming are the new lounge, bar and dining areas inside the casino building. These entertainment areas feature full bars and big screen TVs for sports, regular TV and also satellite broadcasts of horseracing at tracks around the country. As you know there is no longer horseracing at Hollywood Park but there are rooms for satellite wagering. bar areas with big screen TVs. Update August 18, 2016 The Normandie Casino in Gardena, California, which was closed after federal money laundering charges were brought against the former owners, has been bought and is now operating at Larry Flynt's Lucky Lady Casino. See the photo below. Flynt is the well known publisher, club owners, poker player and owner of the nearby Hustler Casino. While both properties are owned by the Flynt organization they currently have separate players' reward clubs. 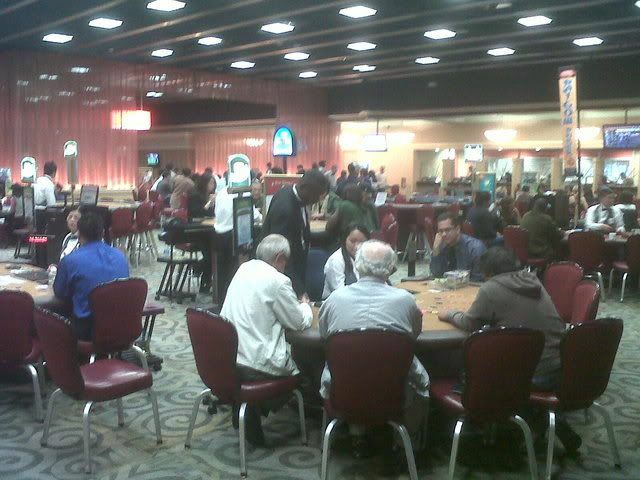 The Lucky Lady Casino has 60 open tables including poker and some Vegas-style "California Games" including blackjack. Normandie Casino used to have a "card craps" game but Lucky Lady does not have one. The Lucky Lady is undergoing renovations which are valued at $60-million. If you sign-up for the rewards club there is a bonus of $20 in free gaming chips and a $5 food voucher. There is also a bonus for redeeming reward credits for cash. The Lucky Lady began operations on August 5th. The website is www.LuckyLadyLA.com and the phone number is 310-352-3400. The casino operates 24-hours at 1045 Rosecrans Avenue in Gardena and is near the 110 Freeway. There are some poker tournaments and more poker tournaments will be added. The former Normandie Casino dates back to the 1940s and was one of the original Los Angeles area casinos. I played there a few times and one of my favorite poker stories comes from playing at a $40 buy-in No Limit Hold'em game when there was a $100 bonus if your pocket aces were cracked. I was in early position at this $40 game with only $36 in my stack when I am dealt AA. With only $36 my strategy and hope was to lose and collect the $100 for having my aces cracked. The big blind was $2 which I called, and every other player at the table also called the $2 big blind. This was a perfect situation for having AA beaten. I was already counting $100 in my hand when the dealer dealt the flop -- and the cards came Jack-Ace-Ace. Yep, I flopped quads. I checked and every other player checked to the river -- so there was no way anyone could make a straight flush so there was no way I was going to get my aces cracked. I played my aces the right way to get them cracked but there was no bonus for me. But the quad aces did get me a free entry into a weekly tournament. Update June 16, 2016 Harrah's Resort Southern California, also known as Harrah's Rincon, in San Diego County, is having a different kind of pay-for-play promotion in its poker room in July. The casino has set aside $10,000 to pay players a certain amount of money according to the hours that they play. The more play, the more they are "paid" to play. Of course, players could lose during that time so this isn't free money but it is an incentive to play in their small poker room that has a limited number of games. Before you invest your time playing there note that there is a limit of $10,000 that will be paid out to all players and if enough players cash out smaller amounts in the early going, there might not be any money left to pay players at the end of the month. There is a photo below of the announcement posted at the casino. The maximum paid to any player is $1,750 which means fewer than six players can get the maximum payout. Update April 8, 2016 One of the downsides of joining a players' club or winning a taxable jackpot at a casino is that employees of the casino can see and have access to your personal information including your name, address, phone number and of course your Social Security number. Information like that can be used to easily open credit card accounts and get loans in your name. You usually trust the casino and its employees with your information, but the reality is one bad employee, or one error in how your info is handled, can mean the theft or release of your identity. On April 4th Morongo Casino in Cabazon, California sent out letters to an undetermined numbers of casino patrons telling them that their personal information -- including address and Social Security number and tax information -- was "released to nineteen individuals." I think the word "released" is an attempt to explain the fact that nineteen employees or perhaps more released the identity information of players in error. But, it's not an error to be ignored. "Morongo Casino Resort & Spa takes guest privacy very seriously.... That is why we want to be upfront and honest with you, our valued guest, about a data security incident that we recently learned occurred January 2016 which caused some of your personal information to be released to nineteen individuals." Morongo says the 19 individuals did not do this deliberately and they are known to the casino. Morongo did not indicate who these 19 individuals are and if they are employees and what positions they might hold. It is not uncommon for casino hosts and those in player development to have access to player records including social security numbers. "While that does not undo the compromise of your information," the letter continues, "it does mean the disclosed information is less likely to be misused." Morongo said it is taking steps to prevent this from happening again and to help prevent damage to its patrons. Morongo is trying to have the data that was released destoyed. It makes it seem that the info might have been emailed to certain employees. Morongo is also offering a complimentary one-year membership in a nationally-known identity protection program. Details about the free membership are included in the letter. Morongo is also urging players to initiate a fraud alert with the major credit monitoring agencies and to check their credit reports. There is also information about how to notify the IRS, local police (not tribal police), the Federal Trade Commission and the State Attorney General. The reality is everytime you join a casino players' club or win at taxable jackpot, some employee is going to have access to your vital information. If you accept the risk of playing in a casino, you have to accept this risk also. Update April 8, 2016 Harrah's Resort Southern California also known as Rincon in northern San Diego County has added a free play bonus giveaway to its monthly cash and free play drawings. All players get one free entry in the drawings by swiping their Caesars Total Rewards card at an entry kiosk, and now when you swipe your card you have a chance to win $400 in freee play. Ten guests will be randomly selected during the activation for the $400 in free play. On Saturday, April 30th there are hourly drawings for $1,000 of free play (five per hour from 1pm to 10pm, and a $50,000 cash grand prize drawing at 11pm. Update March 28, 2016 Some casino-goers like to plan their casino visits on days when they get the most from free play offers. Regular players might find that in addition to weekly or monthly offers their favorite casino might have some additional free play offer during a weekday, or perhaps on a Sunday. These "bonus days" are usually days that the casino marketing departments have identified as slower days for casino traffic. You might find that Tuesday, Wednesday and Thursday have additional free play offers because midweek is usually slowest for player traffic. Mondays are also a good day for free play offers because weekend visitors are usually gone by Sunday evening and many people have a Monday work day. I just received via email a free play offer for Mondays in April from Agua Caliente Resort and Spa Resort Casino. Every Monday I get $150 of free play which is pretty generous considering I haven't been to the casino since October of last year, and when I was there I gambled a total of $200 on their $1 7/5 Bonus video poker game. While 7/5 Bonus is not considered a "full pay" video poker game, it is about what you'd expect to find at most Las Vegas casinos. I mention that because I wasn't playing a game with a huge house edge such as penny slot machines, and my $200 did keep me playing for a fair amount of time even without any big winning hands. Under those circumstances, I think the $150 of free play each Monday in April is pretty generous. I also think my failure to return to the Spa Resort Casino (where I originally played) is the reason why this offer is so generous. It's rare to have extra free play offers on Saturday which is the usual peak day for casinos. Sunday free play offers may be limited because many casino players might stay for a full weekend or just visit on Sunday. Friday offers may also be limited because of players who arrive for the weekend. Some players also like to "casino hop" from one casino to another when they have free play offers valid on the same day from multiple casinos. Some players will "hop" from Pechanga to Pala to Rincon to Valley View to use free play offers from all those casinos. Of course this would mean they have some sort of play history at all of the casinos and since all four of those casinos are within a half-hour car ride it is indeed possible for someone to do that. A player with free play offers at Morongo and at Agua Caliente or Spa Casino Resort might be able to hop among those casinos. In Las Vegas casino hopping to cash-in multiple free play offers is practiced a lot by locals, and Southern California casino players might be able to do the same thing here with some advance planning. Update March 19, 2016 Harrah's Resort Southern California, which previously was called Harrah's Rincon, is raising the competitive stakes in Southern California for casino cash drawings and free play giveaways. On Saturday, March 26th, Harrah's Resort Southern California will have three drawings for $50,000 cash plus hourly drawings for $1,000 of free play and in certain hours there will be five winners of $1,000 of free play and in other hours there will be ten winners of $1,000 free play. Each member of the Caesars Total Rewards players club will receive one free entry into the drawings, and additional entries are earned based on casino play in several days leading up to the drawings. Clearly, the drawings favor players who have earned a lot of Total Rewards Tier Points representing a lot of casino play. However the drawings are said to be random with winners generated by a computer selection and in the past low-level players have won prizes. And, playing a lot does not mean you will win. Players must swipe their cards on the day of the drawings to be entered. Players should also check with the casino for complete rules and regulations including the time limits to claim the prizes. In the case of the three $50,000 cash drawings, the winner must claim the prize within five minutes or an alternate player will be called as the winner. In the case of the $1,000 free play prizes, if the winners do not claim their prizes the free play prizes will be lost. In the past the casino did not call alternates. Winners of the free play awards will have one-hour to claim their prize. The casino has had monthly $50-thousand cash drawings but this is the first time there will be three separate $50,000 drawings on the same day and they are during afternoon and evening hours. This might pressure other casinos in Southern California to increase their prizes and giveaways to stay competitive. Southern California casinos are active promoters of contests and free play giveaways. Update March 15, 2015 In my email today came an offer from Harrah's Resort Southern California. It was for $80 worth of Reward Credits (8,000 Reward Credits) in the Caesars Total Rewards system. The 8,000 credits are a celebration gift for my birthday and it can be downloaded at any slot or video poker machine during my birthday month which is April. $80 worth of RCs would pay for a couple of buffets or half of a dinner-for-two at Fiore, the steakhouse at Rincon. There are other options for the Reward Credits: they can be converted to free play at a reduced rate, and they can be downloaded in San Diego County but used on a trip to Vegas. I received this offer because Rincon has my birthday through the Caesars Total Rewards program. That's another advantage for joining Total Rewards. Other casino players clubs might have similar birthday offers or deals. Update February 24, 2016 Different casinos have different days when they give bonuses on their free play offers. For Casino Morongo near Palm Springs the bonus day is Tuesday. Morongo just sent out mailers to members of its players club listing free play offers. Usually there are four free play offers each month but sometimes there are five free play offers. There are five in March. And on Tuesdays there is a free play bonus. Morongo management believes that Tuesday must be its slowest day which is why the free play bonus is set for Tuesdays. Other casinos have free play bonuses on Sundays or Fridays, but on Sunday Morongo has hourly drawings plus drawings for cars. In March, Morongo is having drawings for $8,000 of free play each Sunday plus a drawing for a Audi A5 Cabriolet. On March 10 Morongo has dawings for a custom motorcycle plus $8,000 of free play. There are also bonus free play awards on Thursdays. If you are going to the casino to maximize the free play and drawings it's best to check the casino's calendar of events to determine the best dates to show up. Update January 23, 2016 Players Casino in Ventura, just off the 101 Freeway, is a small, locals casino. I have been living in Ventura for several months and I finally decided to stop in and take a look around. Like other non-Indian casinos in California this is a "card casino" and the games are limited to no-limit hold'em poker, Omaha 8s or better poker, Ultimate Texas Hold'em and Blackjack. You will not find video poker or even card craps or roulette wheels with cards instead of a ball. Players Casino is a small casino with about ten tables for poker and six tables for other card games. There is a small restaurant attached to the casino with casual dining like burgers and fries in baskets and earlier in the evening there was live music. I didn't stop in to eat. Players Casino is not a luxury casino either. Hustler Casino near Los Angeles is still the most luxurious of all the non-Indian poker casinos in Southern California, with Pechanga in Temecula near San Diego the second nicest. Players Casino is cleaner than Commerce, but a step below The Bicycle. The restroom at Players Casino was relatively clean but nothing worthy of my web page of the best public casino restrooms. Link: http://alanbestbuys.com/id223.html The Bicyle Casino which is a hands-free, touch-free restroom is still tops and I wish other casinos including casinos in Vegas would follow its design. Players Casino is certainly cleaner than what Commerce Casino has on it's main floor. The poker games have modest limits which is fitting for a locals' casino. The No-Limit Hold'em Poker games start with $1-$2 blinds with a minimum $50 buy-in. Players Casino really is a locals casino and during my first visit there I could tell that nearly everyone there was a regular. During the course of the evening one player came to our table who moved from Colorado to nearby Oxnard and it was his first visit there also. But for the most part it seemed that the dealers knew all the players and the players knew all the players. There is free parking and the parking lot is relatively small. The parking lot is well lit and is within a fenced area because the casino is in the Auto Mall. There was lots of security inside and outside. The security guards inside the casino wear handguns which is something common in the poker casinos in California but something you will never see in Vegas because in Vegas they wouldn't risk a shoot-out with robbers because they don't want the liability of a patron getting shot. In California we patrons aren't worth that much, I guess. I saw a couple of players get food service -- I think they had tacos. And there was a lot of drinking and starting at 1:30am the drinks must be removed from the table. The casino is open 24/7 except for a couple of nights when it closes for several hours for cleaning and there is a daily tournament schedule on their website www.pcventura.com. I thought the dealers were fast and friendly and knew what they were doing. No complaints. There was no trouble with patrons either -- no arguments, no fights, no yelling, no bullying, no one abusing dealers. About 10% of the players were women. The Omaha game is played every day, I was told, and the table was full. It's unusual to find Omaha played on a daily basis because it is not a popular or well-known game -- but you will find it at Players Casino. Update November 21, 2015 It appears that just about everybody who has a brick and mortar casino was starting to get ready for legal online poker and perhaps also online casino gambling, but California has fallen far behind other states. Nevada and New Jersey have taken the lead and they might even be able to merge their operations into an interstate online network soon. Now, those brick and mortar casinos no longer seem to be interested in online gaming. More than 60 California Indian casino companies and card clubs created a website for online poker called CalShark.com but it went "dark" and no longer offers free online poker. You will find that some casinos in California have associated themselves with free online poker sites in an attempt to establish their names should online poker and online casinos come about. The State of Delaware has online casinos. Hustler Casino near Los Angeles recently created an online poker site that also has free video poker games, and the Hustler sites has cash prizes for its tournaments with no cost to enter. South Point Casino in Las Vegas has created an online poker site. Caesars Entertainment has had an online casino for its Total Rewards card members and it now has a site for those within the borders of Nevada. Caesars already has pay-sites operating in Europe. The Bicycle Casino in Los Angeles has been offering live video of poker tournaments on its LiveAtTheBike.com website. Another free online site is www.Cafrino.com and it offers small cash prizes for tournaments which are paid through advertising revenue. COPA is a coalition of California tribes and card rooms dedicated to providing a safe and secure option for online poker that maximizes the economic benefits to California. More than 2 million Californians currently play poker online without any regulation of site operators or consumer protections, and none of the jobs or revenues stay in California. As California's gaming partners, tribes and card rooms have created more than 64,000 jobs and generated billions in state revenue. Regulated online poker for Californians, by Californians will ensure that jobs and revenues remain in California. Among the card room casinos that were part of COPA were Commerce, Bicycle, Hollywood Park, Normandie, and Crystal Park. But missing from the list was Hustler. Among the Indian casinos that were part of COPA were Morongo and San Manuel, but missing were Harrah's Rincon and Pechanga. You get the idea that sides in the upcoming turf battle for online gaming are already being set. Update January 20, 2014 There is a small casino in northern San Diego County that is making a big play for players from other casinos. The small casino is Casino Pauma which is nestled in the orange groves between Pala Casino and Harrah's Rincon and this month is running an attractive offer that specifically targets "better players" from neighboring casinos. The Casino Pauma offers offers equal players club benefits plus one week of free play equal to the player's free play from another casino. So for example, if you have a "Diamond" card with Harrah's Rincon down the road with $100 of free play each week, Pauma will give you membership in its players club equal to Diamond status plus $100 of free play. This offer is open only to new players club members at Pauma. I took advantage of this offer and what you see in the photo is the various players club material from Casino Pauma that I received that is the equivalent of 7 Stars with Harrah's Rincon and the Caesars Total Rewards program. In the photo is a special parking pass for Optimum+ players (equivalent to 7 Stars with Caesars Total Rewards) plus the membership card, a free buffet pass for one visit, and information about the casino and their Players Club. The cash out tickets came from the $140 of free play that Pauma gave me -- I got lucky on video poker. Of course Pauma is doing this because they want to get people in the door to check out their casino and quite frankly it is a very nice, very pretty and very clean casino. I was very impressed with the modern restroom with touch free appliances for men, including touch-free soap and towel and automatic motion-sensor sinks. For those of you who play video poker, you will find that many of the popular "mainstream" video poker games at Pauma have better "pay tables" than what you will find at nearby Harrah's Rincon. Pauma is also a smaller casino and that makes it "friendlier." I was impressed with the touch-free men's room appliances and sinks. I thought that the bars and restaurants were very attractive (though I didn't take advantage of the free buffet I was offered with my sign-up) and the casino was bright and not overly loud and even in the "smoking section" the air wasn't too horrible for me, a non-smoker, to breathe. Southern California locals looking for a "locals casino" to play video poker and even blackjack might want to check out Casino Pauma. They currently offer $3 blackjack but I did not check the rules. The tables game section is also small and I did not see any version of traditional craps at the casino. The Players Club at Casino Pauma is open 24/7 and there is valet parking and convenient parking. For information call 877-687-2862 or go to www.casinopauma.com for directions to find the casino. To be honest if a traffic light hadn't been installed at the turn off for the casino, you'd probably zip right by the casino if you were driving between Pala and Rincon or going further towards Valley View Casino. A bigger question for video poker players in Southern California is if Pauma's better video poker pay schedules will put pressure on other casinos in the area to maintain their good paytables or improve their poor pays? But if Pauma is trying to challenge Rincon for its video poker players it has a special challenge: video poker players at Rincon also get "benefits" that can be used at Caesars casinos in Vegas -- and Pauma can't offer a Vegas connection right now. Update December 29, 2014 In the next few months, all of the pieces of the construction and renovations at Harrah's Rincon Casino in San Diego County will come together. It will no longer be a "mid-sized casino" with a hotel in the hills of northern San Diego County, but instead will be transformed into a casino with a convention and events center with one of the largest hotels in the area. In fact, it will be the largest casino-hotel in California. The casino floor has also been changed -- again -- and for players who scout for the better video poker paytables they will see that Rincon can no longer be considered as having the best video poker. In 2013, the casino-hotel opened a new pool area (Dive), ‘ritas Cantina -- a restaurant and bar, the Taco Truck, and The Events Center, and Corked which offers a Craft Beer and Wine bar. The video poker room which once was in its own room has been shifted onto a main portion of the casino floor but it can still be considered a "video poker area." Restrooms have been upgraded. In January a Starbucks will open on the casino floor. And in early April the new hotel tower that includes an additional 403 rooms is scheduled to open that will give Rincon a total of 1,065 total rooms, making it the largest casino resort hotel in California, as well as the fourth largest hotel in San Diego. The casino will also be opening a new bar (where Club Cappuccino -- a coffee bar used to reside) that they're calling “Spiked.” Spiked is a bar that will focus on hand-crafted classic cocktails with a modern twist, using the freshest ingredients and best liquors in an upscale environment. The early artist conception drawings showed customers in dressy attire. Rincon will also be reopening the food court area in April including Pink’s hotdogs in a newly redesigned/renovated space. And a new eatery called Earl of Sandwich will be added as well as a new seating area. WILL CALIFORNIA EVER VOTE AGAIN ON EXPANDING CASINO GAMING? Update September 23, 2013 It was almost nine years ago when voters in California said "no" to a state ballot initiative that would have changed the state constitution to allow for more casino gambling in the state. Voters said no to allowing card clubs and card casinos to offer traditional Vegas casino games including slot machines and traditional roulette and traditional craps or dice games. I've often wondered if the idea might resurface? And over the years, when I get a chance to talk to casino executives here in California the answer is always the same: no, there will not be another effort to change the gaming laws in the state. I can't imagine why the casinos wouldn't want to offer the same kind of craps game and roulette game that is played just over the border in Nevada. Keep in mind that California is the giant feeder market for Las Vegas casinos. So, why wouldn't California legislators want to keep that money here in this state, where jobs and tax revenue would be given a boost? I can understand how many would oppose having slot machines in the card clubs that are in major metropolitan areas. But what would be the problem if California casinos could offer traditional roulette with a wheel and a ball? The Native American casinos have a roulette game that has a wheel that spins but numbered playing cards are in slots and they determine the game -- not where a ball lands. And what would be the problem if California casinos offered traditional dice craps? Both card clubs and the Native American casinos offer card craps where shuffled and dealt numbered playing cards simulate the roll of two dice and a traditional craps game layout is used. It seems to me that another ballot initiative to spread slot machines and video poker games might be hard to push through -- even if it did mean more jobs and tax revenue. But why not a ballot initiative just to make games such as roulette and craps that are already played in California casinos more like the games Californians really want to play? There are many Vegas-style casino games that are played in California just as they are played in Nevada including Blackjack, Let It Ride, Mississippi Stud, poker, Ultimate Texas Hold'em and more. So why not play roulette and craps in California the same way they are played in Vegas? ARE THE CALIFORNIA POKER CASINOS BLUFFING WHEN THEY SAY NO SLOT MACHINES? 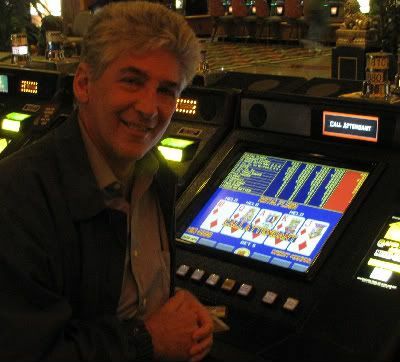 Update February 23, 2012 I am starting to wonder if the big California poker casinos are bluffing when they say they will not make a second attempt to change the State Constitution to allow them to have slot machines and other Vegas-style casino games. I'm wondering if they are bluffing, because shortly after I raised the question about card casinos making another play for the right to have slots, several of the card clubs had their lawyers contact me immediately saying emphatically "no." And as we all know, when someone says "no" in politics it means "check back with me later." Well, some of us have experience that's what "no" really means. But let's go back a bit to understand what got the lawyers talking fast and typing emails even faster. Earlier this month the Rincon band of Indians which owns the Harrah's Rincon Casino in northern San Diego County won a federal lawsuit which pretty much means that its compact with the State of California -- it's deal to have gaming -- was illegal. It was illegal because big taxes were forced on the Rincon band in order to get more slot machines. Now, it appears that the Rincon band can add even more slot machines without having to pay more taxes to the State to get them, and some tax rollbacks might be coming. The federal lawsuit might also open the door to other Indian tribes to get lower taxes for their casinos too. And that might lead the State of California to find other sources of gambling revenue to replace what the Indian casinos might not be paying in the future. And that's where putting slot machines and Vegas-style games in the existing California card casinos comes into play. It was in 2004 when Proposition 68 was on the ballot in California. Prop 68 called for the Indian casinos to pay more in taxes or risk losing their exclusive deal for slots and Vegas-style games. Prop 68 would have allowed 16 card clubs and race tracks to operate a combined total of 30,000 slots if the Indian casinos didn't agree to higher taxes. Well, Prop 68 went down in flames (about 84% voted "no") and in part because of massive political advertising by the Indian casinos, and by Vegas interests who were afraid of losing even more business from California -- the number one feeder market for Las Vegas. But now, with the State of California possibly standing to lose a lot of casino tax money, the State might be looking to expand casino gaming beyond the Indian reservations. Tax money is tax money whether it comes from slots on Indian land or from card clubs and race tracks around the State that also install slots. The original sponsoring organization for Prop 68 doesn't seem to be active. It's website hasn't been updated since 2004 and when I called I got a voice-recorder and I left a message though the message machine didn't say if I had reached the Prop 68 organization. Meanwhile, several of the card clubs that would have been getting slot machines under the old Prop 68 dispatched their lawyers to contact me. One casino's lawyer wrote: "despite the Rincon ruling... will not be supporting any effort to change tribal sovereignty over slot machines in California." And one casino executive wrote: "the Los Angeles card casinos have taken obtaining slot machines off their wish list and are focusing their growth strategy on making their card games as popular as possible." However, another gaming executive with close ties to card casinos wrote: "Perhaps the State will look for additional revenue from the commercial card clubs by offering them the abilitiy to have slots now that they have lost their strong-arm tactics of negotiating with the tribes." And another card club's lawyer wrote to a card casino supplier: "I think that Alan Mendelson is at least partially right. I have been saying for years that if the tribes win that case, they will encourage state legislators to legalize taxable casinos closer to population centers." The email from the lawyer was forwarded to me by the business owner. I think that right now everyone is waiting to see what the other Indian casinos are going to do. If they decide to use the Rincon court decision to fight their own taxes paid to the State, then I think it's a good bet that someone who operates a card club casino will be saying "here's our chance, again." Are the card casinos who are right now saying "no way" just bluffing, or are they stacking their chips ready to go all-in again? Update January 31, 2013 About a year ago we reported on the California Online Poker Association which was created by 60 brick and mortar casinos in California. COPA created a free online poker site Calshark.com and the organization was pushing for an intrastate online poker site that would not be part of a nationwide online poker organization that federal legislation might set up. Well, last summer COPA disbanded when it became clear that the California legislature would not move quickly to establish an intrastate online poker business and the free online site also shut down. Our original report on COPA and Calshark.com still appears on this page. There hasn't been much discussion about intrastate poker in California in months but Nevada has taken big steps to set up online gambling within the state. COPA's original plan was to get its own operation going so California would not have to have its poker options dictated by the giants in Nevada. But the way it looks now, that's just what will happen in the future. In the meantime, any progress towards online poker for California players is full of doubt. Update January 16, 2013 Today's casinos look a lot different from the casinos of the 1950s. Electronics is one reason why you see the new multi-line slot machines with visuals and videos and animation. And in the table games pits there are new games because players seem to get bored quickly with the traditional casino staples such as roulette and blackjack and craps. Some of the new table games keep pace with other gaming trends, as in the development of Ultimate Texas Hold'em because of the popularity of traditional Texas Hold'em. Some of the new table games are spin-offs of traditional table games such as Card Craps, and the Scossa Dice Game and Rapid Craps and California Craps by Pirouz Gaming and you can read about those games here on our "Dice Games, Craps, Card Craps" page. New games are being invented all the time. I had the idea for a one-dealer game played at a half-table called "Simple Craps" which is only a passline or don't passline game that pays even money. The shooter rolls till the passline bet is resolved. One dealer, half of a table, fast and perfect for beginners who don't understand all of the other bets on the table. When new games are invented, they need to go through a testing phase both for regulators and casinos to determine the viability of the games. At Hollywood Park right now a new game is being tested called "EZ*9" which is a card game played at a table similar to a blackjack table with one dealer. Players and the dealer are dealt three cards to make their best hand using two or three cards and the best possible hand value is "9" and hands can push or be a draw. Some combinations are automatic winners even if the dealer also has a 9 and these automatic winners for the players are 2-3-4 and 3-3-3. The idea for the player is to have a better hand than the dealer. Numbered cards count at their face value, but picture cards count as zero. So a hand of 5-4-K is a 9. However, you can't have a hand such as K-K-9 because in this game the numbered cards 7, 8, 9 and 10 are elmininated from the deck. What makes these new games attractive is the idea of a jackpot or bonus that pays big money. At Hollywood Park Casino in Inglewood near LAX, where EZ*9 is being tested, the minimum bet is $10, plus a $1 fee for playing, and there is a $1 jackpot bet which is not mandatory but I am sure will get plenty of action. With the $1 "Triple Match Jackpot Bonus" bet certain three-of-a-kinds are paid a bonus. If you are dealt 3-3-3 in Diamonds the payoff is $1,500. Any 3-of-a-kind in the same suit (suit as three Aces in spades is paid $250. Get three of a kind in the same color, such as 3 Kings with two hearts and one diamond and the pay is $100. And any three of a kind with mixed colors and suits pays $50. 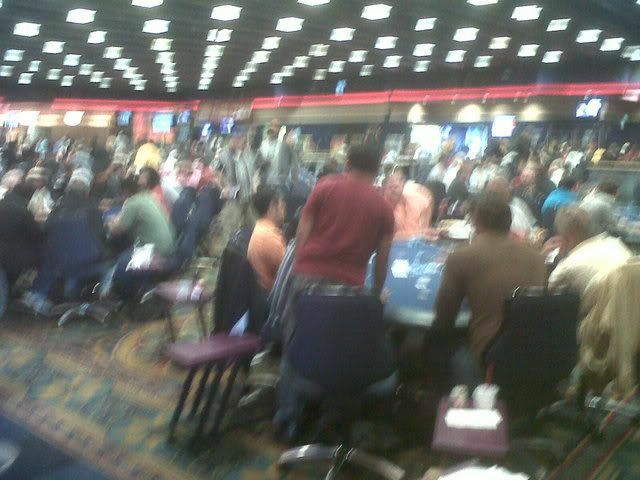 When I was at Hollywood Park Casino to check it out the table was not in use. But it looks as though the casino wants to give a try. It was prominently placed and when I walked over to take a look at it, a floor person immediately approached me and asked if I wanted to play. Because it is a simple game to learn and to play -- and not pricey either with a $11 basic bet ($10 to play plus the house fee of $1) and the bonus bet of $1 I think this game could see some action once players find out about it. When the Bicycle Casino created a new type of poker game, they had demonstration games with "play chips" to get casino regulars familiar with the game. Demonstration games for this game, probably on a busy Saturday night, would likely bring in some new customers. Update December 15, 2012 There are big changes at The Bicycle Casino in Bell Gardens, the card club known as "The Bike" for short. I just stopped in there for the first time in about a year and found that daily poker tournaments have been moved to the area that used to feature "California games" and most of the California games including Paigow and Blackjack and 3 Card Poker have been moved onto the main poker floor. The Bike still features California games under a tent where smoking is allowed -- but in the brick and mortar section of the casino (most of the gaming space) California law does not allow smoking. There are more changes coming including the addition of a hotel and more conference space. Restaurants are being added. In the high limit poker room (actually high limit refers to games with a $100 buy-in) the cage (cashier) has been moved to make room for more table space. In the high limit room food service continues to be free to all players -- and that includes the full menu of American and Asian dishes, desserts, soft drinks and even jumbo shrimp cocktails. Even "common dishes" such as omelettes are expertly prepared and come with chef-crafted sides. The tables and chairs in the high limit room are relatively new, in excellent condition, and the chairs are plush and comfortable. What I particularly like about The Bike is that it has perhaps the best-kept and cleanest restrooms of any casino I have ever seen with the men's rooms being totally "touch free" and I commend The Bike for making those improvements and investments. (See the "Casino Public Restrooms" page for photos.) Also, The Bike has a wonderful menu and delicious food. There is plenty of free parking and the "close in" Valet Service for $5 per car is very fast and efficient. And overall, the tables and chairs are in very good condition and players feel comfortable there. The Bike also has very good dealers at its cash games, but it often uses "new dealers" to staff tournaments and some of these dealers lack experience so players should be a bit understanding if the payouts on split pots take a little longer. The Bike is smaller than The Commerce Casino which is still the largest poker room in the world, but I give The Bike higher marks and more points for a better playing environment. While the nearby Hustler Casino is also known for its beautiful and elegant playing areas and casino environment and food service, The Bicycle Casino gets a higher score from me because of its restrooms. I actually consider the restrooms as a high priority because if a casino goes out of its way to maintain clean and healthy restrooms you feel that it is doing other things to also maintain high standards that aren't as visible. The Bicycle Casino also has daily noon No Limit Hold'em tournaments for $40 with no rebuy or add-on which gives new players a low-cost way to experience tournament play. There are also evening and midnight tournaments. And once a year, in January, The Bicycle Casino hosts the WSOP Circuit Event. The Bicycle Casino is just off the 710 Freeway, about twenty minutes from downtown Los Angeles. Update November 13, 2012 Hollywood Park Casino in Inglewood, California, near the Los Angeles International Airport right now is probably the leading casino for giving perks to its poker players. In addition to hourly "scans" of player cards at the poker table, good for meals or cash-back, Hollywood Park also offers bonus coupons that can be used to get "comp credits" of $5 an hour. And with enough "scans" or hours each month, players can get additional benefits and prizes. So it's no wonder that some players have found ways to milk the system. The point of the comps is to reward players for their play, and to offset to a certain degree, the "drop" or "rake" that all players contribute to during the course of play. But some players found they could milk the system by checking in and taking a seat at the tables -- then leave the tables and hoping their cards will still be scanned and the bonus credits will continue to rack up. Hollywood Park does have a rule that says players must be active at their tables to receive a scan, but this rule for the most part is overlooked, and even when players are not at the tables, employees have been scanning their cards anyway. This helped players to take advantage of the casino's comp and reward system, and being an "advantage player" at Hollywood Park did work for quite a while. Well, something was bound to happen to stop the abuse by players, and it finally did about a week ago. There is a new rule at Hollywood Park that says if a player misses the big blind more than once, the dealer will remove the equivalent of the big blind from the player's chips on the table each and every time a big blind is missed after the first miss. And if a player doesn't have any chips left, another player will be put into the seat. This means "absent players" will have to pay a "big blind penalty" after the first big blind they miss and the big blind penalty can wipe out the value of the hourly comps earned while playing. This system is not only fair to the casino, but it's also fair for the other players. Often several players will leave a table at the same time, forcing the remaining players to play short-handed and face the blinds more often. Hollywood Park Management did the right thing. Update October 8, 2012 So what's hot at Harrah's Rincon? After its public relations nightmare of removing 9/6 Jacks or Better and downgrading other video poker paytables there really isn't much left at Rincon that sets it apart from nearby casinos including Pala and Pechanga which still offer many full-pay video poker games. But Rincon is getting some attention for offering two -- and only two -- Dreamcard video poker machines. The Dreamcard machines are located in the video poker room and you will often find both of the games in use. And you will see frequent hand-pays at the machines. And those handpays attract many gamblers but before you start inserting your Benjamins in the machines be aware of the risks of playing these games. But before I tell you about the risk, let me tell you why they can be very rewarding. Look at the photo on the right. It shows quad aces played at the $1 denomination for a total payoff of $2,000. Nice hit. And what made it "nice" is that three aces were dealt and the "dream card function" automatically gave the case ace for the jackpot. The "dream card function" is a bonus feature that pops up between about 30% and 50% of the time you play with full coins bet. And if you get the "dream card function" the machine will give you what would be the best card for the hand. If you are dealt a single Ace with a "dream card" you will get another ace. But if you are dealt three aces with a "dream card" you will get the fourth ace. And yes, if you are dealt four cards to a royal flush with a "dream card" your royal will be completed and if you played three hands or five hands or ten hands on this multi-hand play machine, all of your hands will be automatic royals. This is why you will see so many hand pays going on at the Dreamcard machines even with players at the 25-cent denomination. You'll see even more handpays at the 50-cent and $1 denominations, especially when ten hands are played. Now let's talk about those risks. Remember you don't get something for nothing in the casinos. And in the case of Dreamcard you have to bet double to be eligible for the "dream card bonus." So if you play five hands of bonus poker which normally would cost 5 X $1.25 or $6.25 on a normal five-play machine, on a dream card machine the play will cost you twice as much or $12.50. If you were to play five hands at the $1 denomination, five hands will cost you $50. Now, if you hit quad aces, that $50 will mean nothing when the floor person is counting $2,000 into your hands. But if you only get a paying pair with a dream card then you will not break even but you will actually lose half of your money played. In other words, you have to hit and you have to hit big or this game is going to hit you hard. By the way, "honest" players will tell you about their big payoffs, but they will also admit that they spent hundreds of dollars between the big payoffs. A truly lucky player will get the big pays relatively close to each other. One more note about Harrah's Rincon. The company has confirmed plans to expand the size of its gaming floor and it is building a second hotel tower. 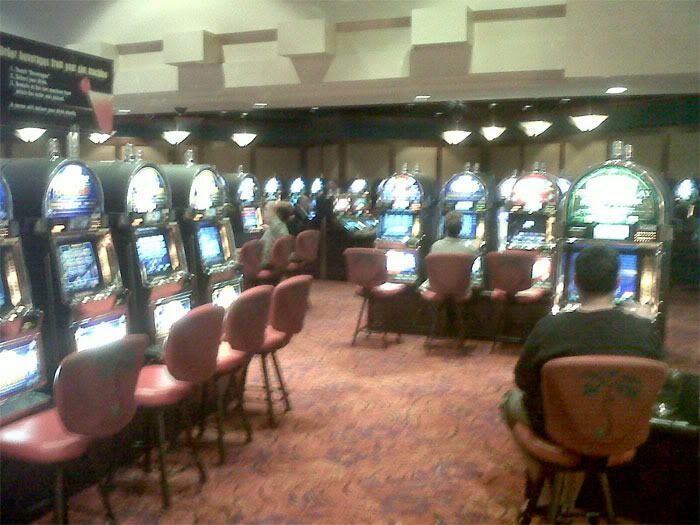 The gaming floor will no doubt include more machines but we don't know if those machines will include poker or slots. It seems to us that Rincon management is more interested in slot players than in being the leader of the market for video poker. Update September 9, 2012 Whenever you plan a long road trip to a casino, you have to plan on gasoline for the car. If you are driving from the Los Angeles area to Las Vegas, for example, you plan your gas purchases so that you can avoid the high-priced gas in Baker, California which has been called a "gas trap." The situation is a bit different driving to the casinos in San Diego County because several of the casinos have their own gas stations or nearby stations with competitive prices. Pechanga for example is right in Temecula has its own service station where comp dollars can be used, and there are also several major brand gas stations nearby, just off the I-15 Freeway. Pala Casino which is after Pechanga and further off the I-15 also has a service station plaza with competitive prices. But until recently, Harrah's Rincon in Valley Center, which is about another 20 minutes further than Pechanga and about 15 minutes from Pala, did not have a nearby service station. Well, there's one at Rincon now. This new gas station plaza (see the photo) opened about a month ago and it has a Shell gas station with competitive prices and they offer the Ralphs Supermarket gasoline discount. There is also a 7-Eleven convenience store, a Subway fast food restaurant, and a Citibank ATM. You cannot use "comp dollars" from Harrah's Rincon to purchase gas here, but Harrah's Rincon does offer Shell gift cards in its gift shop that can be purchased with Total Reward comp dollars. The gift cards come in denominations of $50 and $100 (ask about lower denomination cards being available) and they are priced at double the value of "comp dollars," so a $100 Shell gift card costs 200 comp dollars. This new gas station makes driving to Rincon in Valley Center more convenient, and may eliminate the need for a "pit stop" in Temecula on your drive there. Update August 2, 2012 Harrah's Rincon Casino has eliminated the requirement that players punch in a three-digit code number to redeem free play on slot and video poker machines. Now, players are sent free-play notices in the mail, and when their Total Rewards player cards are inserted into the machine, the free play announcement appears. Players then only have to enter their own PIN to download the free play. This follows the system that has been used at nearby Pechanga. And this change frees up the necessity to either remember your code numbers or having to visit the Total Rewads desk to get the codes you forgot at home. No doubt this will mean shorter lines at the Total Rewards desk and it also means players will get to the machines faster. Update July 8, 2012 You will still find 8/5 Bonus Poker at Harrah's Rincon, but if you are playing Double Double Bonus Poker, which is probably the most popular video poker game, you will find a disappointing 8/5 pay table meaning 8 coins for a full house, 5 coins for a flush. Before the downgrade, Harrah's Rincon offered 9/5 Double Double Bonus on its progressive games, and some 9/6 pay tables on non-progressive Double Double Bonus games. Now, it's just 8/5. Of course, the 8/5 pay table does not affect payouts on quads, and on the "bonus quads" with or without kickers such as quad 2s, 3s, 4, and Aces. And if you get a royal flush like the one in the photo on the $1 Double Double Bonus game that was hit early this morning, the 8/5 pay table doesn't effect your payout either. A royal flush is a royal flush no matter if the "pay table" is 9/6 or 9/5 or 8/5 or even 6/5. But keep in mind, when the pay table is poor and you don't make the big quads or the royal, the machines can eat your money quickly. As you can see, the pay table on the $1 Double Double Bonus progressive pays 8 coins for a full house, and 5 coins for a flush, for each coin played. But the pay table doesn't effect other payouts including the Royal Flush. And in some cases, the jackpot on the royal flush can be big enough to offset the lower paytable on the full house and flush pays. Many experienced video poker players will shun a game such as this because the 8/5 Double Double Bonus pay table is considered to be "weak." The "return" for an 8/5 pay table is slightly less than 97% while the return for a 9/5 pay table is just under 98% and the pay table for a 9/6 game is just under 99-percent. Of course, when you hit a royal, or quad aces, the lower return from the reduced pays on full houses and flushes doesn't matter as much. Update April 28, 2012 Well, we finally got a look at the new video poker machines and the improved paytables installed Harrah's Rincon Casino. These new machines with better pay tables were installed after management there was flooded with complaints about its decision to remove its full-pay video poker games. About three weeks ago, Harrah's Rincon installed the new Game King multi-game, multi-denomination video poker machines in its video poker room, and Rincon restored the full-pay paytables on several games at even the lowst 25-cent per coin bet level. But some regular players of video poker will be disappointed since it appears that 9/6 Jacks or Better is gone. We were the first to find out and publicize the casino's plan to lower paytables and after we reported that the pay tables were changed the casino was flooded with complaints. Almost immediately, managers at the casino told me that a "mistake" was made and the lower paytables would be removed, but some paytables would still not return to the previous full-pay levels. Well, we gave the new Game King machines a closer look. The Game King multi-game, multi-denomination machines are in the video poker room along the wall. And when it comes to Bonus Poker, the traditional 8/5 pay tabes are back -- even at the 25-cent per coin level and also for 50-cents, $1 and $5 games. But players will be disappointed to find that the best Jacks or Better game is also an 8/5 pay table. So if you have any question about which game to play -- and the choice is between Jacks or Bonus -- its's a no brainer to take the 8/5 Bonus. 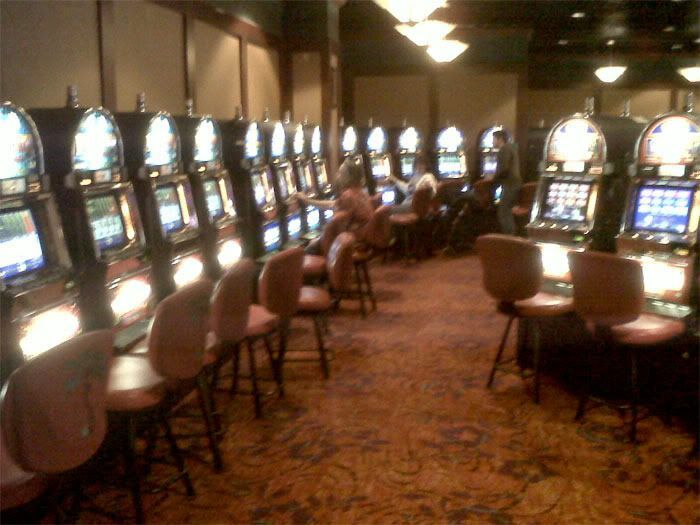 Below is a photo of the line of new Game King machines, and as you can see there are plenty of them. Next is a photo of the 25-cent per coin Bonus game with the 8/5 pay table. Notice that this is not only the full pay version of Bonus but it also has the traditional payoffs for quad aces, deuces, threes and fours. The controversial pay tables that were replaced paid 125 coins for all quads -- and there were no bonus quads with bigger payoffs. But gone is the 9/6 pay table for Jacks or Better. The new pay table is 8/5 and this is actually an improvement. For a couple of weeks, Rincon tried to force 7/5 and 6/5 Jacks down the throats of its players. The photo below shows the new 8/5 Jacks or Better pay table on 25-cent machines. HARRAH'S RINCON CASINO YIELDS TO PRESSURE OVER VIDEO POKER, BUT NOT BY MUCH. Update March 28, 2012 Less than two weeks after removing just about every full-pay video poker pay table in the casino, Harrah's Rincon has started to restore a few of the full-pay pay-tables on its higher limit video games, and in some cases it has enhanced some of the weak pay tables that were installed on its machines. But players who were used to the full-pay games at Harrah's Rincon are likely to still be disappointed. Gone are the 9/6 (9 coins for a full house, 6 coins for a flush) Jacks or Better machines -- even for $100/coin players. The best available pay table now for Jacks or Better on the $100 was 8/5. I also saw the 8/5 pay-table on $5 machines. Players who were used to 8/5 Bonus Poker that had a pay table of about 99.2% will now find an odd looking pay table that pays all quads the same. By lowering the quad payoffs for aces, deuces, threes and fours, and by slightly raising the quad payoffs for everything else, the new "8/5 Bonus" game at Rincon now has a payoff of about 98.5-percent. See the photo of the pay table below. The pay-table in the photo above replaced the pay-table in the photo below which was installed about two weeks ago. The pay-table in the photo below was an absolute disaster with 6/5 payoffs on full houses and flushes. Floor personnell, slot hosts, managers and player hosts have been telling me that many players immediately objected to the downgrade of the pay tables when they were made earlier this month. But it is likely that these same players will be disappointed that Harrah's Rincon didn't fully restore the pay tables they had. Rincon employees were told by top level managers that the pay tables were lowered to boost profits. If that's really how Rincon managers were thinking they made a major blunder. The problem with Harrah's Rincon was that they failed to properly promote their full-pay video poker games that even included the 25-cents per coin level. At many competing casinos, video poker at the 25-cent level has inferior paytables and that made Rincon stand out as a good place to play. Video Poker is a major draw for casinos and had the full-pay games at Harrah's been properly marketed the casino would have drawn gamblers not only from throughout Southern California but also from Las Vegas where full-pay video poker is hard to find at the major resorts. Harrah's Rincon could have promoted itself as a true resort-destination for video poker lovers and in addition to a large array of full-pay games, Harrah's could have also promoted its entertainment and spa and resort facilities. Instead of taking a positive approach, managers pulled the rug out from beneath their customers and their reputation among knowing players. Over the last week or so, Rincon slot hosts and managers have been telling players that the casino made a mistake by lowering the pay tables as much as they did. Well, Rincon managers have maybe one more chance to make things right and to give the mistake a proper fix. They could quickly restore the full-pay games they had before and quickly come up with a marketing campaign that acknowledges that they listened to their players and made things right again. Then they could jump on that to add a second campaign to let players throughout Southern California and Southern Nevada know that the best video poker available is in Northern San Diego County. This type of promotion will take more than billboards and sixty second radio spots and display ads on the Internet. This kind of promotion will involve an education campaign -- to explain to gamblers why they have a better shot at winning at Rincon. Even if all of the full-pay games are restored, the casino will stay have its edge and will still turn a profit. Full-pay games that have a 99.5% payback still have a 0.5% edge for the house on each hand played. And since experienced video poker players can play five hundred to seven hundred hands per hour that 0.5% edge represents a lot of profit for the casino. So the casino should not fear full-pay games. 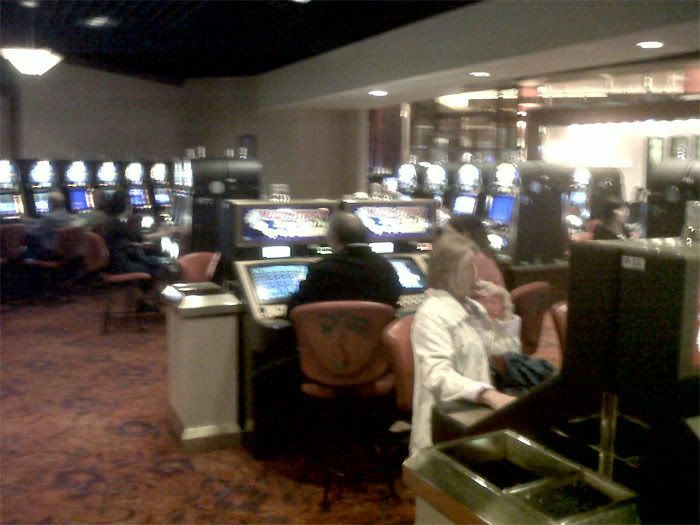 In fact, with less than full-pay it is faced with a lot of video poker machines that are not being used. And, idle machines cost money because idle machines mean fewer players and less money spent on hotel rooms, in restaurants and a lower house return on the gaming. I'll give the marketing managers at Rincon a few ideas to help them out -- because it appears they need help with their marking. Invite some of the big-name professional video poker players and authors to tour the facility, check over the games, and hold educational lectures for players. This is a marketing plan that many of the Vegas casinos use to lure players -- and it works. It's also time for the casino to stop marketing the typical casino glitz and the typical promotions and to start educating potential customers about why the games at Rincon pay out more money. Gamblers are smart and they aren't lured by billboards that promote big cash giveaways anymore because they know the odds of winning those jackpot drawings are slim. But tell gamblers that they have a good shot at the games they'll be playing and watch their response! The problem with most casino executives and casino marketing managers is that they are not gamblers themselves. Harrah's Rincon just proved that when they ripped away the full-pay video poker tables. Let's see if they catch on and listen to their customers' complaints and learn how to fix their problem. Update March 15, 2012 Beware the Ides of March is what Julius Caesar was told before he was slaughtered, and today -- the Ides of March -- video poker players at one of the Caesars' casinos will find that their favorite video poker games are being slaughtered. Harrah's Rincon, a Caesars casino in San Diego County, has literally destroyed the favorable paytables on nearly all of its video poker machines. It was a little more than a year ago that I reported how Harrah's Rincon created a new video poker section that was full with many full-pay games and many of the full-pay video poker games were available even at the 25-cent per coin level. Well, the full pay environment at Rincon ended starting this past Monday and early this morning technicians at Rincon were continuing to change the "chips" inside video poker games to lower the paytables. It's all about profit. A company vice president assembled casino workers earlier this week and announced that the video poker section at Rincon was not profitable and it was time to become profitable and that meant reducing the payout tables on virtually every machine in the place. Games that were not favorable to players before are now even less favorable. And the popular full pay games such as 8/5 Bonus Poker, 9/6 Jacks or Better Poker, and even games such as 9/6 Double Double Bonus are being wiped out. On the "Bonus games" such as "Bonus Poker" and "Aces and Faces" poker the popular 8/5 pay table has been replaced by a 6/5 pay table even in the high limit section. Even at Caesars Palace in Las Vegas it is still possible to find plenty of 7/5 Bonus and some 8/5 Bonus games. Below is a photo of the new pay table for "Aces and Faces" which pays back about 99.2% with an 8/5 pay table (8 coins for a full house and five coins for a flush), and now it pays 6 coins for a full house and 5 coins for a flush which is a payback of under 97-percent. And gone is the traditional pay table for Bonus Poker which gives a larger payout for quad 2s, 3s, 4s, and Aces. Below is a photo of the new paytable for Bonus that players will find on $5 and up machines which pays the same jackpot for all quads and also has the 6/5 pays for a full house and flush. The payback here has also been reduced by about 2-percentage points. Even high rollers are finding their games are getting reduced paytables. Below is a photo of technicians changing the paytables on the $100 per coin video poker games. I took this one from a distance. A security guard is with the technician and a manager as the chip is changed. The $100 per coin and $25 per coin machines were changed early Thursday morning, and some of the $25 per coin machines were being switched to $100 per coin machines according to one of the casino employees. High rollers not only are getting poor paytables just like the 25-cent per coin players, but the high rollers are also getting cuts in their free play awards according to one of the managers who spoke to me in confidence. The manager said that some $100 per coin players were getting all of their free play eliminated. "It's all about profits, it's a business decision," the manager told me. When I reminded the manager that the nearby Pechanga Casino still has many full pay video poker games, the Rincon manager said "yes, we know that. We are going to lose a lot of players." Below on this page you can see my original report from January of 2011 when Rincon created its large video poker room that was loaded with full pay machines. As I looked at the reduced paytables in the video poker room early this morning, a player commented to me -- "they might as well turn this back into a live poker area. They're going to lose the video poker business real fast." It will be interesting to see what Pechanga Casino -- California's largest casino, and the largest casino in the Western United States -- does now that Rincon has cut its paytable. Will Pechanga keep its better paytables or cut them now that Rincon has reduced its paytables. I invite you to comment on this development at Rincon and what you find at other casinos that offer video poker. Please click here and go to our Forum thread about the change at Rincon. One thing I noted early this morning is that while some video poker players did notice the changes in the paytables, some video poker players did not. In fact, many players I spoke to told me they were unaware of the differences that the pay table changes make. That is surprising. Update January 25, 2011 This announcement got my attention: On February 11th, Pechanga Casino in Temecula is going to have a slot tournament, open to 1,000 players, and the Guinness Book of World Records will be there to authenticate it as the world's biggest slot tournament. Well, that's not really got my attention. What got my attention is that the tournament is free and open to everyone 21 years of age and older, and what also got my attention is the significance of a casino being able to link so many machines on its casino floor to participate in the same event. And a tournament for one thousand players is attention grabbing especially when a total of $100,000 in prizes is up for grabs. The tourney is sponsored by Pechanga and Bally Technologies and the tourney games will be played on Bally's machines. I've seen big slot tournaments before but usually they are played in shifts of about a hundred players at a time -- but in this tournament 1,000 players will play simultaneously. It helps that Pechanga is the biggest casino in the Western United States (yes, bigger than anything in Vegas) and with more slot machines than anything in Vegas. And this tournament is made possible because Pechanga has the new "computer controlled games" from a central computer or server which allows managers to control the games on many computers at one time. The tournament will award $100,000 in total, with 200 people taking home prizes and the ultimate winner receiving $25,000 in cash. Registration begins at 8:00 am, is free and open to all Pechanga Rewards Club members. Anyone 21 and older with a valid ID can sign up free for a Rewards Card and ambassadors will be on hand to register new players wanting to make history at Pechanga. The tournament will start at 11:00 am. All who are in line to sign up by 10:30 am will play, with successive rounds being held, if necessary. The future of this technology will allow slot tournaments to happen instantly at prescribed times or even as a surprise, where any player can elect to participate or not participate, as they choose. But I question if this should really be a world record event. I prefer the old days when world records meant fastest speeds for the mile or the 100 yard dash or for birthdays or number of wives or husbands. Not slot tournament participants. Update January 6, 2012 On Monday, January 23rd the Hustler Casino will be celebrating the Chinese New Year with a traditional Lion Dance, lucky money drawings, lucky red envelopes, and special menu items for dining. The celebration starts at 8pm with the traditional Lion Dance presented by the East Wind Lion Dancers, accompanied by a traditional percussion band. If you have never seen a Lion Dance before this has two Chinese lions dance throughout the casino spreading good luck and happy wishes for the New Year. To top the evening off Hustler is featuring a special buy-in Pai Gow Poker game! You can reserve a spot for this. Update December 16, 2011 The Hollywood Park Casino in Inglewood has made changes in its players club which will benefit patrons of the casino. Under the new plan, players club points do not expire each month, and now rollover to the next month and can be used indefinitely as long as the account remains active. To maintain an active account there must be one "card swipe" each 90 days. Players Club accounts that do not have activity during the three month period will have the points expire. Different casinos have different rules about how long players club points remain active or when they expire. In the case of Caesars (Harrah's) points expire if there is now activity after a six-month period. This six-months term made sense for a company that caters to visitors from around the country who might make only two visits to a casino property in Las Vegas each year. Hollywood Park, on the other hand, caters to locals in the Los Angeles area and one visit every three months is certainly reasonable. Update November 19, 2011 The Bicycle Casino in Bell Gardens (just off the 710 Freeway) has added a new high hand daily prize. The best hand between from 12-noon until the next 12-noon wins the newest model iPad. This is in the high limit (yellow chip) section of The Bike, and when I stopped in to ask about the new daily contest the current high hand for the day was a royal flush in clubs. Yes, it's unlikely that hand will beaten by another high hand and it will win the iPad that will be awarded for the play during that 24-hour cycle. And in other news from The Bike, this casino starting on New Year's Day will host WSOP Circuit Tournaments including the prized WSOP "Ring Events." The various tournaments start at $150. I think this is the first time that WSOP Circuit Events have been played in the Los Angeles area. Harrah's Rincon Casino in San Diego County has hosted the WSOP Circuit. Update October 30, 2011 Saturday October 29th was the poker tournament at the Commerce Casino near L.A. that raised money for two charity groups-- the Renal Support Network which helps those with kidney disease, and Love Across the Ocean which helps families and children in Vietnam. It had a large turnout of players and celebrity guests including several Hollywood stars, local TV newscasters and several of the top professional poker players including Man The Master Nguyen and Annie Duke. A buffet was included in the event ticket price and Commerce put on a great buffet that lasted through the entire tournament action. Frankly, I've played in other fundraisers where the buffet preceded tournament play -- but this buffet kept the great food coming with a chef to carve up great assortments of beef. There was also an auction that included items from celebrities and hats off to Hollywood star Jack Black who donated several autographed items including framed posters and autographed scripts from his movies and musical instruments from his collection. Man The Master donated personal souvenirs from the World Series of Poker including personalized chips from Binions Horseshoe Casino. I donated to the auction video production and advertising time on our Best Buys TV Show and soon I will be producing a video for the auction winner. I played in the event and I played well until my final hand (it's always like that, you know) when I lost to a player holding pocket aces to my pair of queens. Usually I don't do well in tournaments because I play "too tight" and that often leaves me with a short stack when the blinds and antes are high. Below is the video that I produced to promote the tournament. Update October 22, 2011 In the last several days I received several emails from Hollywood Park Casino in Inglewood announcing that its remodeling will be completed soon and on November 11th it will have a grand reopening with various giveaway and promotions. So, I couldn't resist taking a look at what is going on there. And frankly, I was both impressed and at the same time disappointed at what is being done. The main poker room which is the giant room to the right of the main entrance is going to be closed. I was told that this large room will be converted into conference rooms, meeting rooms and banquet rooms. It might also take the shape of a convention center. This actually makes sense since Hollywood Park Casino is on Century Boulevard and only a few minutes from Los Angeles International Airport -- LAX -- and various hotels on Century Boulevard. However, is another convention or banquet area needed? Below is a photo of the main poker room-- and this room will soon be closed. To the center and left of the main entrance of the casino is the "California Games" section and the bar for horse race betting. That area is now being remodeled with new carpet, new tables, new wall decor, new lighting and will be the new Hollywood Park Casino. All of the poker tables from the big room will be moved into what was before the California Games section. Poker tournaments, I was told, will be moved upstairs into the old ballrooms when larger turnouts require the extra space. But smaller, daily tournaments will probably be held in the regular poker area in the new casino. There was a lot of empty space behind the California Games section and no doubt that area will now be used when they move the poker games over. Below is a photo of the remodeled California games area at Hollywood Park. The poker tables will be relocated nearby. Right now, there is plenty of free parking just off the entrance to the large poker room, but once this area is closed and then converted to something else, and parking will also be use by the new events center, I wonder if the parking will still be as convenient. Remember that the parking lots can become crowded when events are held on the race track grounds, and when there are races there. I am sure that regulars at Hollywood Park will welcome the new digs, and it probably will put some pressure on The Commerce Casino to upgrade its facilities. While The Commerce is still the biggest poker casino in the country, it trails Hustler, Pechanga, The Bike for appearance and newness. And there's a good chance that players will also take notice of the renovations at Hollywood Park when they are completed. 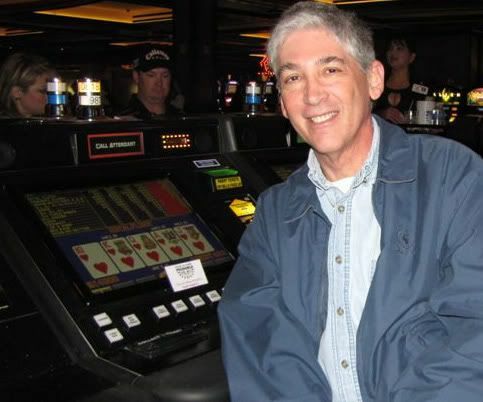 Update October 20, 2011 Below is my interview with Pierre Wuu, the Executive Director of Online of the California Online Poker Association. This is an association of sixty brick and mortar Indian casinos and card casinos in the state that now operate www.CalShark.com which is a free online poker site. In this interview, Wuu reports that the COPA expects that the California State Legislature as early as this January will begin work on legislation to legalize online poker for money within the state of California. I also asked him about proposals for federal legislation that could legalize online poker for money nationwide, and the possible competition from the big Vegas gaming companies that want to operate online poker across the country. There is a lot of information here about the goals of the California casinos and how they want to keep the California online poker business separate from any online poker systems in other states and that includes a national online poker system. My interview with Pierre Wuu was conducted at The Commerce Casino, which happens to be the largest poker casino in the world. The COPA envisions the California Legislature allowing the licensed casinos in the state to operate a regulated for money and for profit online poker site because the licensed casinos would have their right to do business at stake should any foul play be detected by regulators. By operating the online casino, the brick and mortar casinos would also be able to take deposits and make payments through their casino cages and cashiers, and they would be able to coordinate betting limits state-wide. COPA will argue that an intrastate-only online poker system would be more beneficial to California taxpayers because they believe California players would be the biggest online poker market. They will argue that a nationwide online poker system that includes California would take revenue and tax dollars out of California, and California would be a net-loser in a federal system. Read more about the California Online Poker Association on this page below. Update August 19, 2011 Right now, there are really only two table games that prevent California Indian Casinos from being just like the casinos in Las Vegas and Nevada. Those table games which are significantly different in California from the original versions in Nevada are craps and roulette. In California it is against the state rules and regulations to throw dice to decide the outcome of a game, and that is why dice are not thrown to decide the bets in the various versions of craps in California. Casinos in California -- including the card clubs -- have come up with various versions of craps that either use some sort of playing card to simulate a roll of dice, or two dice are thrown but the decision of the dice is used to determine some randomly shuffled cards. In California it is also against the rules and regulations to have a roulette wheel that is spun and to have a ball drop decide which number is the winning number on the wheel. To get around this various types of simulations were developed including loading the numbers from a roulette layout of balls that are picked out of a bingo machine. But now, Harrah's Rincon Casino and Pechanga Casino opened up a new kind of roulette game that is almost exactly like the roulette game played in Vegas and in Nevada. At Rincon and at Pechanga a dealer spins a wheel but instead of a ball picking the number from the wheel, the wheel has playing cards in 38 slots and each card marks a number on the traditional roulette layout and a pointer picks the "lucky number" when the wheel stops spinning. It is almost exactly like spinning a roulette wheel in Vegas only there is no ball drop. And at Rincon and Pechanga there is no card shuffle as each of the 38 slots on the wheel has a card pre-loaded in its "slot." This is the latest game change in the California Casinos' attempt to mimic all of the Vegas games. And unlike "card craps" which never caught on, and throwing dice to pick shuffled cards, this innovation of a wheel with cards might actually catch on. I've seen this game attract crowds at both casinos. In this first photo below the wheel is spinning. There are no slots for a ball or numbers written on the wheel, because the wheel contains narrow slots to hold what appear to be "playing cards" that give a number and color and say odd or even -- similar to what a deal would call out when a ball is dropped on a conventional roulette wheel. This photo was taken early in the morning when the game was shut down. 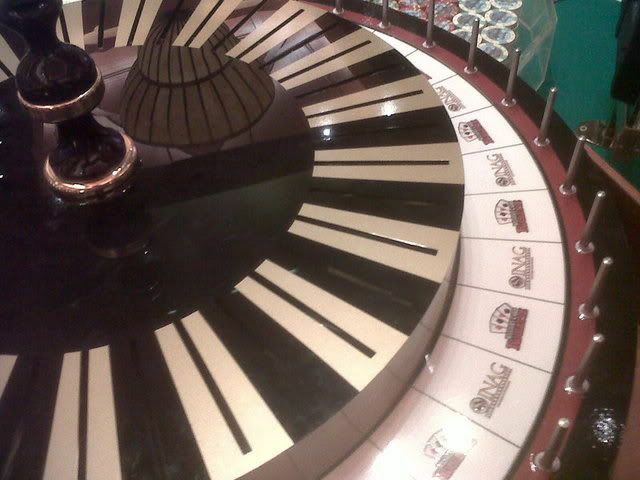 Notice the slots where the playing cards are inserted -- one card for each number on the roulette layout. It is a totally random game, similar a true roulette game and the only difference is that a ball is not dropped onto the wheel. Your eyes are OK but the photo is out of focus. That's the roulette table set up with the layout and chairs for players. Update January 23, 2011 Harrah's Rincon Casino near San Diego has created a new video poker section in what used to be the "live poker" area near the bar and sports TV viewing area. The video poker area actually goes beyond the confines of the old poker room and spills out onto the main gaming floor. The video poker area offers a very nice mix of popular games and what will surprise many Rincon regulars is that the paytables in this new video poker area are better than those found in the high limits area and in other sections of the casino that still have video poker games. For example, in the high limit area you will find $1 double double bonus with a 9/5 paytable, but in the video poker area the DDB game has a 9/6 paytable. This 9/6 paytable for DDB in the video poker area is also available at the $2 level and the $5 level. The progressives for video poker are still on the main casino floor and those progressives continue at the 25-cents, $1 and $5 levels. But the $5 progressive with the progressive only on the royal in the high limit area still has the 9/5 paytable, and the $1 progressive has the 9/5 paytable as well but the $1 progressive also has progressives for quad aces with and without kickers and the small quads (2, 3, 4) with and without kickers. All of the progressives at Rincon are on the double double bonus games. The new video poker area also has some of the new "hot" varieties of VP including the "Dream Card" game and this is available for three-hands, five-hands, and ten-hands with various denominatons including 25-cents and $1 and others. The nearest ATM to the video poker area is actually outside of this area. Inside the video poker area some of the machines are crowded together meaning you will be sitting very close to neighboring players, but there are also some games along the back wall that offer plenty of comfort. Most, if not all of the terminals, are upright -- and we saw very few of the slant-top machines that you will find in the high limit area. The upright machines can be tiring to play but it's one of the tradeoffs for playing machines with a better paytable. In the time I was there on a Saturday night during "prime time" there were no cocktail waitresses making the rounds. We also found in the new video poker section those 1-cent 50 play and 100 play VP machines and yes, there were some players playing only one line at a time which meant they could play video poker with only one coin on one line for a penny per hand (or play). In the high limit area there are also 50-play and 100-play VP machines starting at the 5-cent level which means you can play in the high limit area for as little as one coin on one line or just 5-cents a hand. We took some photos (no, we didn't get permission, but no one stopped us) which we are going to show you. Update January 19, 2011 Pechanga Casino in Temecula says that its Mega Share Bad Beat Jackpot hit at $208, 085 late Friday night, paying off 30 percent of the jackpot ($62,501.00) to the losing hand of four queens to Monique Tolentino of Murrieta. The royal flush held by Perry Panno may have won the pot, but took second in the jackpot payoff, with 20 percent or $41,617. Such is the nature of a “Bad Beat” jackpot, where the losing hand wins. In the Pechanga Poker Room, it took beating quad tens or better to trigger. When the high hands were declared, there are two qualifying rules that come into play: both the winning and losing hands must play their two hole cards, with the board playing first. In this instance four queens (Qc,Qd,Qh,Qs,Ac) was beaten out by nothing less than a royal flush of clubs. The other six players at the table shared 30 percent ($62,426) of the jackpot, or $10,404 per seat. In addition, all 183 active Texas Hold’em players in the room took home a combined 20 percent ($41,541) of the jackpot, or $227 per seat. Update September 22, 2010 For the second time in a year, someone has hit a jackpot of more than a million dollars on the Indiana Jones slot machines at the Pechanga Casino in Temecula. The second mega win came today on the Indiana Jones penny slot machines and within the last year this same bank of machines created another winner for about a million dollars. To hit the mega jackpot a maximum bet of $4 must be made -- and that's 400 pennies on a penny slot machine. But when a million dollars or more is involved, a few hundred pennies can be considered "worth it" don't you think? The winner today was a San Diego woman who hit for $2.4-million dollars plus some small change of another 74-hundred dollars or so. Less than a year ago, on the same bank of machines, a Long Beach man hit for one million dollars plus change -- change of another $61-thousand. The two lucky machines are actually back-to-back on the casino floor at Pechanga. Pechanga, by the way, is the biggest casino in the Western United States -- with more slots than any casino in Vegas, even. Pechanga also has a $100,000 live poker jackpot for a bad beat in which four-of-a-kind is beaten by a superior hand. A few months ago a similar bad beat jackpot was hit at The Bicycle Casino in Bell Gardens when quad tens lost to quad Jacks. After that "bad beat jackpot" was awarded, The Bike discontinued the promotion. Many card clubs and casinos typically have bad beat jackpots of smaller amounts when a hand of Aces full of tens or better is beaten by a superior hand such as quads or a royal flush. Updated August 19, 2010 The Commerce Casino, off the 5 Freeway just minutes south of Los Angeles, is the world's largest poker casino, but it also offers various games which are also played in Vegas and other casinos. I just completed an interview with John Griffo of the The Commerce about developments at The Commerce including their development of Vegas-like games, about the possibility of another initiative in California to expand slot machines into poker rooms, the status of online poker, and added entertainment options at The Commerce. Also we discussed the economy and its effect on gaming. We also talked about The Commerce which caters to "home games," and how it has low cost tournaments, and offers free poker lessons. The interview was recorded for my KABC 790 Radio show and we videotaped the interview. Watch the video below which is in two parts. Buster Blackjack is being played on 18 tables at Pechanga and this game has a side bet in addition to the regular blackjack bet. With the side bet, players can wager from $1 to $50 that the deal will bust, and this side bet pays out up to 250-to-1 depending on how many cards it takes for the dealer to bust. Buster Blackjack is a side bet on a regular blackjack table that wins if the dealer busts. The more cards the dealer busts with, the more the player is paid. If the dealer busts with 3-4 cards then the pay to the player is 2 to 1. And if the dealer busts with 5 cards, then the pay is 4 to 1. And if the dealer should bust with 6 cards, then the pay is 12 to 1. And if the dealer busts with a lot of small cards, say 7 cards, then the pay is 50 to 1. Now, if the dealer gets a lot of low cards-- and I mean a lot of Aces-- and the dealer busts with 8 and more cards the payout on this side bet is an incredible 250 to 1. The Buster side bet must be made along with the regular blackjack bet before any cards are dealt. The player and dealer will play out their hands as they would in a regular blackjack game. However, even if the player busts and does not win his main blackjack bet, the Buster bet remains in action, as long as the dealer has no blackjack. If the dealer then goes on to bust, all Buster bets are paid according to the pay tables. In the Pechanga game the dealer hits soft 17. Blackjack is perhaps the most popular of all table games in casinos and the game has undergone a lot of changes in the last couple of years. Some of those changes include paying even money for a blackjack while the traditional game has always paid 1.5 times the original bet or 3 to 2 for a blackjack. While these whopping payouts can make the side bet attractive in this "buster blackjack" game, I guarantee you this-- no side bet will favor the player and will have an edge that favors the house. However, it's the side bets in games like Let It Ride and the Fire Bet in Craps and now this blackjack game that pay the big bucks and make low payout games attractive to gamblers who want a big win for a small wager. Many of the casinos in Southern California are now adding poker tournaments, and for the most part these are low cost tournaments with an entry fee of well under $100. The Bicycle Casino in Bell Gardens has expanded its schedule of tournaments to seven days a week and that means you can play the noon tournament, the 7PM tournament and the Midnight tournament seven days a week. Hollywood Park Casino in Inglewood near LAX has also expanded its tournament schedule with additional weekend tournaments, and the Commerce Casino in Commerce and Hawaiian Gardens Casino in Hawaiian Gardens are also adding more tournaments including one-table "sit 'n go" tournaments. IS IT TIME TO EXPAND CASINO GAMING IN CALIFORNIA? This issue is certain to come up now that California is wrestling with a budget crisis that will not go away despite the recent budget compromise. Perhaps it is time to consider expanding casino gaming in the State. Yes, some of the Indian casinos were allowed to expand by adding more slot machines -- and some of the Indian casinos in California are now bigger than many of the casinos you'll find in Las Vegas. The Pechanga Casino in Temecula is the biggest casino in the Western United States. But perhaps we need more -- not only to help the State's budget, but also to keep gaming dollars inside California instead of letting it go to Nevada. What actions could the State take now? Perhaps it is time to allow the card rooms in California to also offer slot machines and video poker machines. Instead of allowing all card rooms and card casinos to offer slots and video poker, perhaps it might be limited to only the race tracks -- which would mean Racinos, a combination of race tracks and casinos similar to what other States already have. Perhaps it is also time to take some of the gaming restrictions off of casinos already operating here in California. For example, dice cannot be thrown so the game of craps is played by choosing numbers with cards instead of with throwing dice. (Note that some casinos have patrons throwing dice which in turn select which playing cards are chosen to reveal the winning craps numbers.) Perhaps it is also time for the California casinos to offer true roulette wheel games which currently are not allowed. Why? This would keep more Californians in California when they want to play these games instead of going to Nevada where these games are common. California already has 66 Tribal Casinos and 91 cardrooms (written as of today, August 2, 2009) but perhaps there is room for one more casino -- in Barstow on the I-15. This proposed casino failed in a previous attempt but perhaps it is time to have it. Barstow is a strategic location for grabbing Casino visitors on their way to Nevada, because the I-15 is the major driving route to get to Nevada and a Barstow casino (operated by an Indian tribe or comibination of tribes) would give California one last chance to keep that business inside the State. Gaming is a vital industry for the State, and nationwide, about the same amount of money spent on candy is spent on gaming according to the American Gaming Association. But gaming is not a ruinous activity either because Americans overall spend about ten times more on home remodeling than they spend on commercial gaming. I don't want California to turn into another Nevada with slot machines at gas stations and supermarkets and restaurants and bars. But I think a controlled expansion of gaming at existing card and Indian casinos and the addition of a casino in Barstow would make sense and create revenue and jobs for our struggling State economy. HARRAH'S RINCON CASINO ADDS TO THE "CASINO CASH BACK BATTLE." Many of the Indian casinos in California have an active and competitive cash back program and there appears to be a battle going on for who has the best cash back program. Morongo near Palm Springs has been advertising that it has the best paying cash back program for slot play. Pechanga and Rincon have programs for "bounce back" money in which rebate checks and cash vouchers that can be used in slot and video poker machines are sent to players via the U.S. mail. Most casinos send out "bounce back" money once a month, and the coupons that can be redeemed for slot and video poker play are usually sent for "one time use" or several coupons are sent for "weekly use." But now, Rincon is sending out coupons that can be redeemed just about every three days. This means that if a player makes a trip for a few days to Rincon, they might be able to redeem two coupons instead of one during their visit. This could raise the stakes in the competition for players. It's a nice move by Harrah's Rincon. It might cost them a little more up front, but as we all know the casinos win in the end so Harrah's Rincon could keep players spending extra days at their resort and playing in their casino with the new program. I've been hearing the new radio commercials for Pala Casino advertising its new buffet and it's new poker room. The buffet sounds interesting with various "stations" for seafood and meats, but I'm a bit disappointed about the new poker room that only has fifteen tables. Fifteen tables in a poker room? Well I guess Pala could stage a small tournament there for 150 players-- because that's all you can fit on fifteen poker tables. The poker room at Harrah's Rincon -- which is just up the road from Pala, and just ten minutes away -- has about as many tables. But Harrah's Rincon can stage World Series of Poker circuit events by opening its ballroom and by bringing in dealers from the Harrah's properties in Las Vegas as well as "travelling dealers" who follow the tournament circuits. Here is more about Pala's $100-million expansion. There are several new dining spots including Choices, Amigo’s and Sushi Sake. Pala Casino Spa & Resort now offers guests ten dining destinations. Choices is the buffet, and has eight live-action cooking stations— American, Italian, Asian, Mexican, Seafood, Soups/Salads, Desserts and Specialty— and the buffet area is said to be large enough that there isn't a long wait. What a pleasure that must be. It sounds interesting and maybe we'll finally have a quality buffet to enjoy in Southern California, and one that might rival the buffets at Bellagio and Caesars in Vegas? We'll see. Amigo’s, Pala’s new Mexican eatery, offers what the casino resort says is "authentic Mexican cuisine with quick-serve style service, a salsa bar, and cantina style indoor and outdoor seating with a stunning view of the Palomar Mountains." "Also new to Pala is Sushi Sake, a full-service sushi bar. Sushi Sake offers traditional sushi, sashimi, and rolls, as well as an assortment of innovative specialty rolls. Sushi Sake also offers an extensive list of hot and cold sake. Guests can choose between dine-in and grab-and-go options." I like the concept of grab-and-go because now you can grab an order and go to your marathon slot machine sessions. But what I really like about the expansion at Pala is the new dining. Pala's neighbor up the road, Harrah's Rincon, falls short on dining. Update May 23, 2011 If you are going to play "double double bonus video poker" you have an advantage at Harrah's Rincon Casino in San Diego County on certain pay tables. Harrah's Rincon has progressive jackpots on some of its double double bonus video poker games, and the extra money you can win makes playing these games better than other games, including double double bonus video poker games you might find at other casinos. Recently, the jackpot for a royal flush on the $5 double double bonus game topped $69,000 and the normal payoff on a royal without a progressive is just $20,000. Usually the Royal Flush is "hit" in the range of $25,000 to $30,000 which is a nice bonus. But keep in mind that the paytable has a reduction for a "full house" and instead of paying 6 coins it pays 5 coins. Unless you hit the "royal" this makes for a tighter game. Harrah's Rincon also has progressive jackpots on its $1 and 25-cent double double bonus poker games, as well as progressive jackpots on other winning hands such as straight flushes and certain four-of-a-kinds. There is also now a progressive deuces wild video poker game at the $1 level in the new video poker area. Sometimes the progressive jackpots at Harrah's get so big that teams of "professional" video poker players come to the casino to play these machines. I've been told that teams or groups of players come to Rincon from Las Vegas and Reno when the progressive on the $5 game nears $40,000. A team of four or five players will pool their money and play the machines until they win and then they leave. These teams have done this before. But that's not to say that an individual lucky player might hit the progressive first. Harrah's Rincon also has a $1 video poker progressive that uses the Double Double Bonus game. This progressive starts at $4,000 which is what a regular royal flush pays, but it was recently hit at almost $4,900. By the way, video poker players who are "in the know" carefully examine the pay tables to determine which games pay the best. In most "full pay" double double bonus games the full house pays 9 coins for every one coin bet, and the flush pays 6 coins for every one coin bet. But at Rincon, with the progressive $5 game, the pay on the flush is reduced to 5 coins for every one coin bet. This 9/5 payoff schedule is how the progressive jackpot is financed. But curiously enough -- the $5 double double bonus video poker games at the nearby Pechanga casino also pay 9 coins on a full house for each one coin bet, and 5 coins on a flush for each one coin bet--- but Pechanga does not have a progressive jackpot attached to its games. So if you are comparing games-- the $5 double double bonus game with the progressive is a better game to play. And Harrah's Rincon also gives you a better deal with its progressive game than you might find in Vegas. For example, Caesars Palace in Las Vegas -- which is owned by Caesars (formerly Harrah's) -- has $5 double double bonus that also has a pay table of 9/5 but without a progressive. Because of the tough economy, many of the casinos in Vegas have eliminated "cash back" where a player can get a cash rebate on his slot and video poker play at the end of his trip. And many of the casinos in Vegas have also eliminated "bounce back" which is a check or voucher sent to a player that can be redeemed on the next trip. But in California, cash back and bounce back lives so watch your mailbox. Several of the casinos, including card clubs such as Hollywood Park and Hustler Casino, are sending cash offers to their players to get them to visit. And the major Indian casinos including Casino Morongo, Pechanga Casino and Harrah's Rincon Casino all have active cash programs. Harrah's Rincon not only sends out weekly coupons that can be redeemed for play, but it also sends out "bonus vouchers" which can be redeemed for play. Pechanga sends out vouchers that can be redeemed weekly. Morongo boasts about its cashback program being very generous. These cash back and bounce back vouchers and checks are indeed rebates on your play, and the more you play the bigger the rebates. So it pays to be a member of the players club at these casinos, to play with your players cards, and to redeem your vouchers and checks. But be careful -- you don't want to race to the casino just to redeem a $25 bonus and risk betting more than you can afford to at that time. If the cash back and bounce back comes when a trip is planned -- great -- that's the time to use it. Below are my photos of two royal flushes hit at Pechanga. I actually hit two of them in about three months which was darn lucky. Experienced video poker players can go months or even years without hitting a royal -- and I know -- I've gone many, many months without one too. My favorite royal came at Caesars Palace when Shelley and I were talking about getting married. I kept telling her that I was saving up for the diamond engagement ring. I called it the "ring fund." Well, the night I hit the royal, I went over to where she was playing and said "come with me, the ring fund has been funded." Roulette is a very popular casino game, and in Vegas the roulette tables are always crowded with gamblers placing their bets on numbers on a layout hoping that a spinning wheel and a spinning ball will make them rich. But in California, the traditional roulette wheel and game is not legal. Dealers are not allowed to spin a wheel or drop a ball in California. So to get around this, some casinos have had a "California Version" of Roulette. At Harrah's Rincon, the winning number on the roulette table is chosen by a wind machine that chooses a ball, much like a bingo machine. I remember seeing a robot that had a similar method of choosing winning numbers at Morongo Casino near Palm Springs. 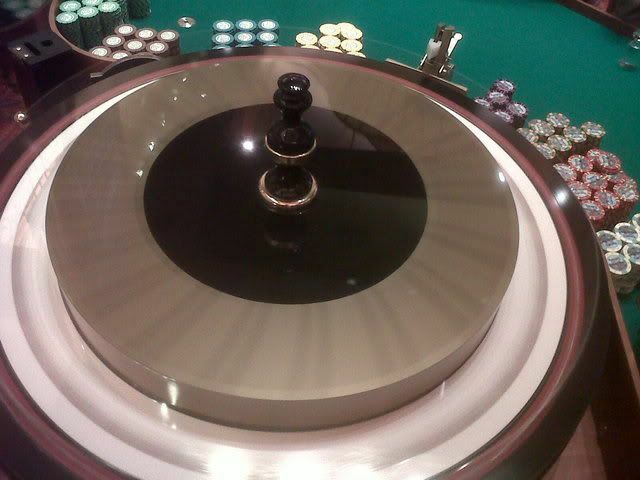 Well, Pechanga is bringing back a "California version" of Roulette and it is because of popular demand, I was told. In fact, floor space has already been cleared for several of these roulette games. The Bicycle Casino in Bell Gardens, also known as The Bike, has changed table limits for its cash no-limit Hold 'Em games. The casino used to have separate tables for $100 buy-ins and $200 buy-ins. But now, there are only tables with a buy-in that can range from $100 to $300 and it is the players' choice. Many players at these tables will buy in for $200 while others will buy in for $100. I saw few buying in for $300. The blinds at this cash game are $3 and $2 which is what the blinds were at the $100 buy in games. This is a break from the $5 and $3 blinds that the $200 buy in games used to have. So now, with the bankroll of a $200 table you can play no limit Hold 'Em with the blinds of a $100 buy in table. The California "card clubs" are trying every way they can to compete with Vegas casinos and the Indian casinos by offering casino games that mimic traditional casino games. For example, there is "card craps" where playing cards are selected to simulate the roll of the dice, and now there is "video poker played with cards." Crystal Casino in Compton which is owned by The Bicycle Casino in Bell Gardens has installed a "video poker played with cards" table, but after observing some play at this game I would suggest that you avoid it. At first blush it appears to be a game like video poker but played with cards. One deck of 52 cards is used, just like in a traditional video poker game. Each player is dealt five cards, and the player must decide which cards to hold. Then the dealer deals three five card hands which are "community hands." If you held two cards, then the first three cards in the three community hands are "your cards" to complete your hand. For example, the five cards dealt to you include two queens, a seven, a five, and a ten, all rainbow -- so a flush is out of the question. Your decision is to hold the two queens. Then the three replacement hands of five cards each are dealt. Because you held a pair of queens, the first three cards in each replacement cards are "your cards" to complete your hand. Unfortunately for each player, this is a multi-player game, and what you may not know is that while you are playing your pair of queens in seat #1, the player in seat #5 also had a queen, and the player in seat #6 also had a queen. So the best you could do with your pocket queens is to get a "push" unless trips flop in one of the three repladement hands which would give you a full house. Several times I saw players hold a high paying pair, only to have their chances of a payoff ruined because another player at the table had one or perhaps both of the cards they needed. In a real video poker machine game, you would hold on to your pair of Queens, and all of the 47 replacement cards -- including the other two queens -- would be available for you to hit on the draw. But not in "video poker with cards." In "video poker with cards" you don't get to draw from all 47 remaining cards. Another problem is that the pay table is weak and does not reflect the true odds with competing players drawing for the same cards you might be drawing for. And the house takes a "rake" or a fee of 25-cents for each hand you decide to play. Several times I saw players with a high pair get a "push" (a break even result) but they lost 75-cents on each hand because of the rake or the fee. Stay away from this game. If your free play is in chips for table games, then use your free chips at the table game with the bet that gives you the best chance of winning. These bets include the passline or don't pass line at craps, or a bet at blackjack. If there is roulette, a bet on black or red. I would stay away from slot machines with your free play credits only because the odds of winning are not as great as the chance of winning that you have with certain video poker games. So, with your free play credits, I would find a video poker game that you know how to play. This is a very important concept, because many video poker players simply do not know the correct strategy for the games they play. For example, in "Jacks or Better" I have seen a player hold a pair of deuces and a king, when the correct play is just to hold the pair of deuces. And in "double double bonus" I have seen a player hold a pair of Aces and a pair of tens when the correct play is just to hold the pair of aces. Most of these free play promotions say you must play through the amount of free credits they give you before you can cash out anything. So, if you have $20 of free play from Rincon, you must play through the $20 and if you have any profit after the $20 is played through you can cash out that profit. So, find a game that will accommodate your $20... that means find a 25-cents video poker machine to get the most play for your $20. And then keep track of your betting. When you have played through your first $20, you can cash out whatever profit you have. At a 25-cents video poker machine with 5-coins played per hand or bet, you would have 16 plays. In many video poker games, you are likely to have a win (a win can be a break even) in one out of three plays. Keep track of your 16 plays, and there is a chance that you could show a win... and then after you make your hit you can run. One thing to keep in mind: the hit and run strategy will not work for a long time. Most casinos send out free play offers only for as long as players maintain a certain level of play. If you don't keep playing the free play offers will dry up. Update May 23, 2011 If you are traveling from the Los Angeles area to the casinos along the 15 Freeway in the Temecula Valley and south in San Diego, your first thought is that driving to Harrah's Rincon Casino is a long drive-- a very long drive. Well, it's worth the drive -- the schlepp, as you might call it. After you exit the 15 at Pala Road, which is the 76, you will drive east... and keep on driving. You will be tempted to stop at the Pala Casino which is the first big casino you will see on the 76. Pass the Pala Casino and you will soon find the road leading to the Pauma Casino. Keep on driving, up into the mountains, and there -- in what appears to be the middle of nowhere, is Harrah's Rincon Casino. It's a big, beautiful casino, rising majestically with hills around it. It's big -- but not too big. And that's really the best feature of Harrah's Rincon Casino -- it's Goldilocks quality. It's big, but it's not too big. It's also not too small. It's just right. It actually is the "right size" casino with plenty of table games and plenty of slot machines -- especially video poker, with a new area in the casino with video poker games with better paytables than you will find in other sections of the casino. But it's not a massive casino. And because it's not massive, customer service is excellent. And the casino floor has plenty of room for walking-- you won't stumble over or between slot machines like you might at the overly crowded Morongo Casino. And you won't get lost in Harrah's Rincon Casino, as you might get lost in the giant, sprawling Pechanga Casino which is now the biggest casino in the Western United States. There is a wide assortment of video poker games, and since video poker is in demand, you will find the games you like. With one exception -- I couldn't find any "good" Super Aces Bonus games, which are my favorite and popular in many other Indian casinos in California. There is a Super Aces Bonus game in the high limit slots area but the paytable is bad. What I did find in Harrah's Rincon were lots of progressive video poker games and machines with payoffs that increase on the royal flush and four of a kind until they hit and then the payoffs reset to traditional levels. These games with progressive payoffs, if the basic pay table is fair, offer the player an advantage. The other big advantage with Harrah's Rincon is that it is part of the Caesars Total Rewards player system, so the Total Rewards points you earn at Harrah's Rincon can be used in other Total Rewards casinos including those in Vegas, and now the play at Rincon can also be used for "points" towards the Great Gift Wrap-Up in Las Vegas each year before Christmas. The Great Gift Wrap-Up event is a shopping event for regular players and high rollers. Update May 23, 2011 Ever since gaming regulators in Nevada warned the Nevada casinos that there was a program on the iPhone that could help someone in card counting at blackjack many casinos have blocked the use of cell phones at their blackjack tables. Well, Hollywood Park Casino in Inglewood initiated its own ban -- not only on iPhones but on all cell phones in the blackjack pit or area of the casino. Hollywood Park is also banning the use of any electronic device in the blackjack pit area including computers and text messaging units. Why? Well a manager at Hollywood Park says that a ban of just iPhones might be unfair -- so if iPhones must be banned to protect the integrity of its blackjack games, the casino managers have decided that it is better to ban all phones and electronic devices. The Bicycle Casino in Bell Gardens has a special arrangement with the IRS. The Bike has promised to withhold poker tournament winning money from any player it finds on the IRS list of delinquent taxpayers. You might know that The Bike was seized several years ago in a drug money laundering case, and when the casino was sold to its new owners, they had to promise to follow the directive to catch gamblers who owed money to the IRS. The tournament directors at The Bike have a long list (many pages long) of players who are delinquent with their IRS taxes, and they are supposed to check all players before they are paid any tournament winnings. There is no "check list" for cash game players -- only for tournament players. MORE ABOUT TIPPING. WHO GETS THE TIPS? There was a lot of interest in the article below about how much you should tip in a casino when you win. Thank you for your comments. Well now I've been asked about who gets the tip money? And that is also a good question, because it can vary from casino to casino and vary by the game you are playing. When you play a live poker game or a cash poker game, your tips to the dealer are generally kept by the dealer. These tips are not shared. In a poker tournament, winners are generally asked to contribute some of their winnings to a "dealer pool" that are shared by all dealers. In a tournament, if you tip a dealer independently, that dealer is usually required to turn over your individual tip to the dealer pool. When you tip for a slot win or video poker win, the tip money is usually not kept by the floor person who pays you out. That money usually goes into an employee pool. The same is true for table games-- the money goes into a pool. But how the pool divides that money can vary from casino to casino. Some casinos might divide the money among all dealers on that shift, while other casinos might divide that money among all dealers over a 24-hour period. How much should you tip when you win in a casino? This is a question that comes up all the time, and there are various answers depending on who you talk to. The bottom line might be that there is no correct answer. But I am going to give you some examples of what I think would be an appropriate tip or gratuity when you win. Let's start with live poker -- cash poker games -- in a casino. Generally, the proper tip to give a dealer if you win a hand is one dollar. However, in big pots it is not uncommon to tip a dealer two dollars or even five dollars. I've seen players tip dealers as much as $20 when they've won a pot of $400 or more. You don't have to tip so much, but you should tip one dollar when you win a pot. In poker tournaments, tipping is different. Usually a proper tip is 3% to 5% of what you win. Now, if you don't finish "in the money," meaning you didn't win, you shouldn't -- or don't have to -- tip anything. I am surprised to find out that many professional tournament players tip very little or not at all because the consider the tournament fees "enough" compensation for the dealers. Frankly, I think that attitude is wrong. I always tip 5% of what I win. If there is a hand pay on a $1,000 win (which is unlikely since most slot machines will print out a ticket for a thousand dollars) I would tip $10. If you get four of a kind on a $5 video poker machine that pays $1,250 or if you get that much on a slot machine, I would tip $10. On a $2,000 payoff I would tip $20 which is 1%. On a $4,000 payoff which is a royal flush on a $1 video poker machine, or a nice slot payoff, I would tip 1% again which is $40. However, I have seen some players tip $100 and frankly I think that is too much. I kind of like the concept of tipping 1% on larger payoffs. So, on a $20,000 royal flush on a $5 video poker machine (five coins in costing $25 per play) I would tip 1% or $100. But to be honest, I have hit several of these royal flushes, and I have tipped $200. Now, table games. You have to be careful tipping at table games because you can tip too much. Let's say at craps you have $25 on the passline and $50 odds and you make the pass. Your win could be (if the point is 6 or 8) $85. If you make another passline bet for the dealers of $10 (which is very common), you've just tipped better than 10%. I always like to have a bet for the dealers on the passline after I win on the passline. I tend to put out a bet of $10 for the dealers when I have $25 on the passline for myself. Well, if the next roll of the dice is a 7 or 11 I will win $25 for myself, and the dealers will win $10 plus the $10 on the passline -- the bet you had out for them. That's a giant percentage of your money going to the dealers. Nothing wrong with that, of course, but just be aware that the dealers at craps can be getting a huge percentage of your bankroll. The same thing can happen at blackjack. Let's say you are betting $25 for yourself and get lucky and win. You might put out $5 for the dealer. That $5 for the dealer can represent 10% of the $50 you just got, or 20% of your own $25 bet. Another way to tip at table games is to tip when you leave the game and tip according to your net win. But how much do you tip based on your net win? I don't know the answer-- but let me tell you this story. 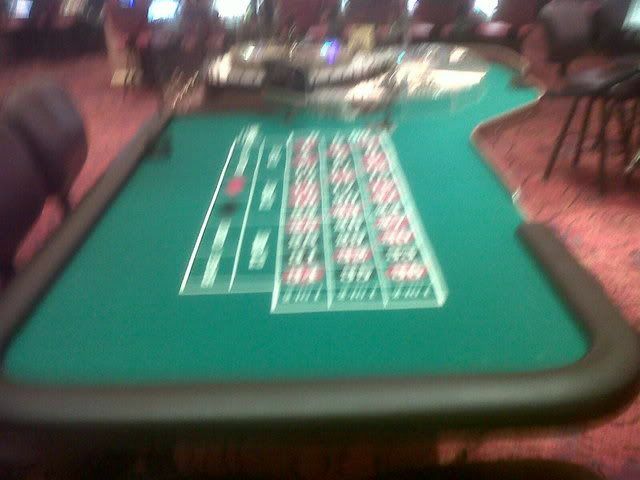 A few years ago a high roller was playing craps at my table at Caesars Palace. He bet big and won big. In fact, he left the table with a net win of $130,000. He did not make any bets for the dealers during several hours of play -- and only tipped as a "hand in" when he left the table. His "hand in" tip was one yellow chip -- that's a thousand dollar tip. That represented less than 1% of his net win, and the dealers were visibly disappointed. Frankly, had he made small bets for the dealers during his stay at the game, the dealers probably would have made more. Again, you will find that different players and different authors have different ideas on tipping. If there is one tipping rule it is this: dealers don't expect a tip when you lose. Update May 23, 2011 You do not have to be a high roller or play at high limits to actually play in a high limit room at some of the California casinos. For example, Rincon, Pechanga and Morongo casinos have high limit rooms that have $1 video poker machines. You can also find $1 video poker machines on the regular casino floors at Rincon, Pechanga and Morongo... but why play on the regular casino floor when you can play in the high limit room where you will find various perks such as nearby and nicer restrooms, better drink service, and better attention from casino workers. At Rincon and Pechanga, the high limit room has its own cashier windows. And frankly, if you want to avoid excess smoke and play in a safer environment, you are better off in the high limit rooms. Rincon also has 50-play video poker machines that allow you to play one line, one coin for as little as 5-cents. So for a nickel, you can be a high limit room player. CAN'T PUT YOUR CIGARETTES DOWN? 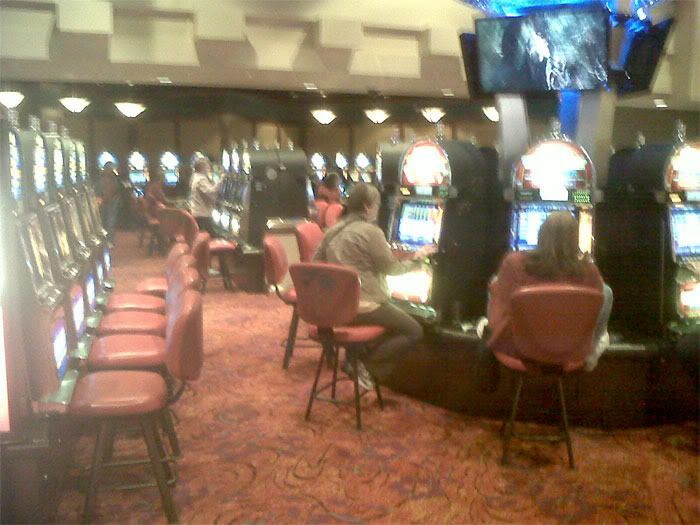 Update May 23, 2011 If you must smoke when you gamble you have several options including gambling in Vegas or Laughlin, or in the Indian casinos in California, or go to The Bicycle Casino in Bell which has some casino games in a tent adjacent to the regular casino. The "tent" is a smoking area at The Bike. And if you want to get away from the smoke at the casinos where smoking is permitted, several casinos now have non-smoking tables and non-smoking areas. But before you play check the rules of the games, the denominations of the games and the pay tables. At Rincon, for example, they have video poker machines in the non-smoking area, but the pay tables on these video poker machines are worse than the pay tables in the smoking areas. Are non-smokers getting a worse gamble? Well, non-smokers may be gambling less with their health but they are taking a bigger gamble playing these video poker games with lower pay tables. Crystal Casino in Compton has discontinued its poker tournaments. The card room at Crystal is small with usually only one or two cash games in action -- both with a $40-to-$100 buy-in. Sometimes there is a "yellow chip" game with a $100 buy-in but this game is dominated by "house players" who are paid by the hour to play. You will also find house players at the lower limit games when a "yellow chip" game is not in action. Stay away-- your time and money is better spent at Hollyood Park In Inglewood, or Commerce Casino in Commerce, or the nearby Hustler and Normandie Casinos which are only a short drive from Crystal Park. California Casinos have been trying all sorts of "new games" to compete with the Las Vegas casinos. Among these "new games" are electronic poker tables where poker is played with computer screens and without a dealer, and "card craps" where dice are dealt to simulate the roll of dice because in California it is illegal to roll dice to determine the outcome of a craps game. Well, the new games haven't worked out. Hollywood Park casino in Inglewood used to have a complete section of electronic poker tables and they were removed after only a couple of months. The casino talked about moving the e-poker tables to another section of the casino, but that didn't happen. And I was tipped off by casino insiders that the company that manufactured the electronic poker tables actually employed players to play at the games-- and the employees were given as much as $500 each during the day to "keep the games going." When the company stopped giving out the cash to "shills," the games ended their run, I was told. Then there is "card craps." Different casinos have different rules and procedures for playing this game, but basically it works this way: two playing cards are chosen among Aces through Sixes to simulate the roll of a pair of dice. The betting layouts and payoffs are similar to what there is in Vegas, but some casinos have a rule that if two suited cards are chosen there is "no roll," but if you bet "no roll" there is a payoff. Well, now it appears that "card craps" is on the way out in California as well. The Bicycle Casino has removed its only card craps table soon. The table had been operating with only limited hours. Hollywood Park Casino also has its single card craps table working during limited hours, but there is no word yet if it will be removed. In fact, we were surprised to see the table filled to capacity with players on a weekday night. Would you like to go to school to learn how to play poker, or to improve your poker skills? Yes, there is a poker school in Reseda, in the San Fernando Valley, called Poker Academy, Inc., and it promotes itself as "LA's only live action Poker School for Players." You can call them for information at (818) 343-4626 or go to their web site www.poker-academy.net for more information. The school is located at 18334 Sherman Way, Reseda. "Students" get to play poker, and are instructed in strategy.